This week features the return of our Paddington correspondent, my esteemed colleague Isabel Hernandez who has turned her attention to the other Paddington. 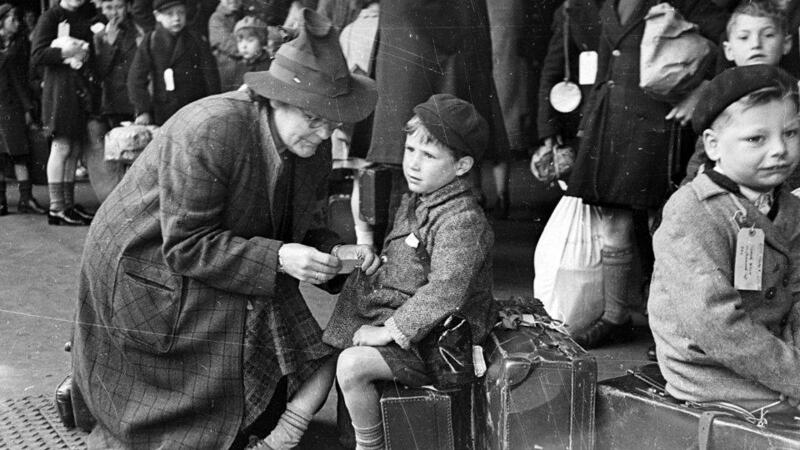 Many will know who Paddington Bear is, where he came from and why he was named after a London station. I also think of him as a West London bear, even if he did originate from Darkest Peru, not Africa, as Michael Bond had originally written, until it was pointed out that there are no indigenous bears living in Africa, so he set about diligently doing his research by paying a visit to Westminster Public Library followed by a trip to London Zoo until he eventually settled on Peru. It may seem strange that a bear should be so iconic (not unlike Winnie-the-Pooh) but Paddington just happens to be so in a very down to earth way. 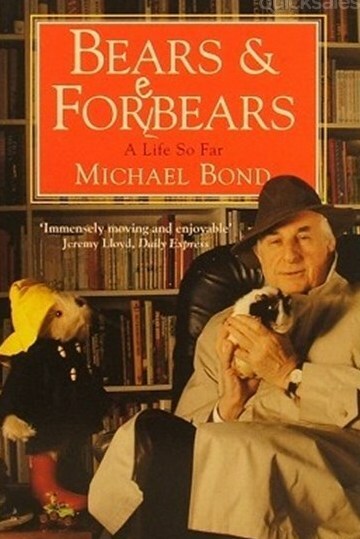 In re-reading the stories recently and hunting for the 50 statues dotted around parts of London before they were auctioned off, I was prompted into reading Michael Bond’s autobiography, Bears & Forebears. A Life So Far, which not only is a guide to how he came to breathe life into all of his creations (for there are others aside from Paddington), but also gives a wonderful insight into his own life and the influences and inspiration that later (I think) contributed to his best known character. Not difficult to see why this was a haven…. 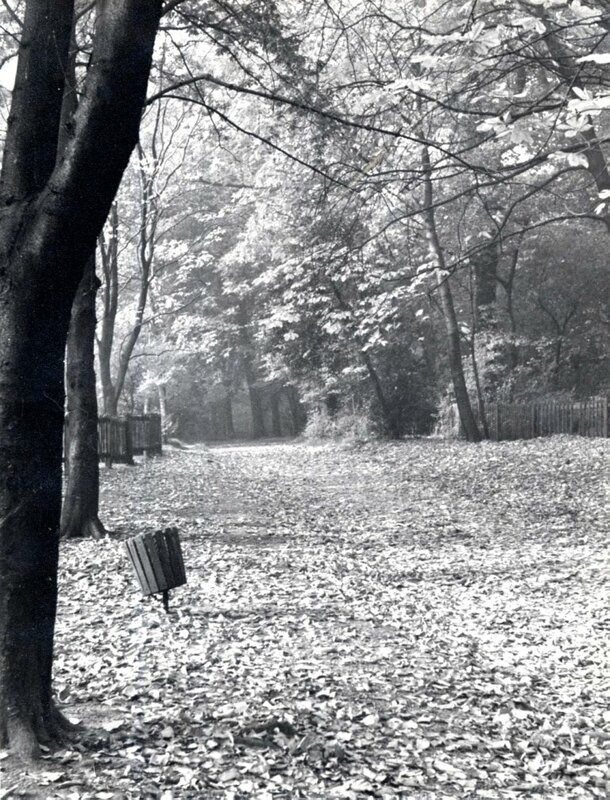 Much has been made of the location of 32 Windsor Gardens where the Browns live. 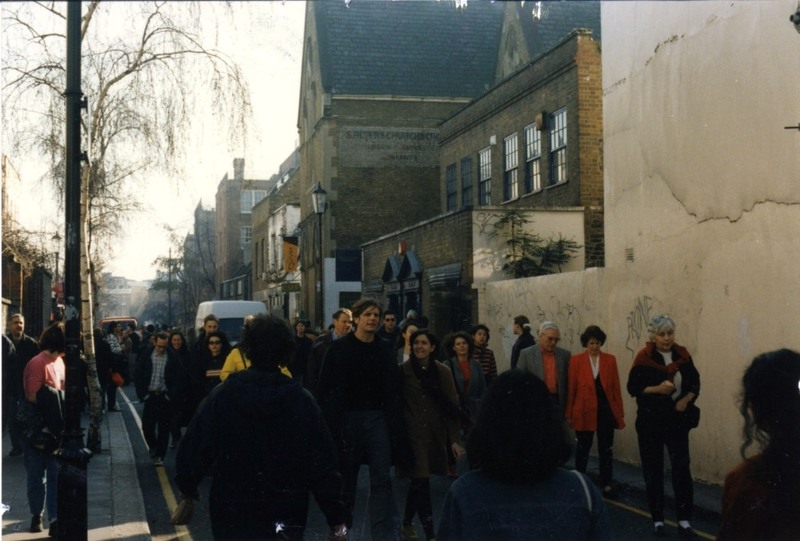 Many have made the literary pilgrimage visiting a location by the same name in West London – only a stone’s throw away from where I used to live in the Paddington area. Karen Jankel (Michael Bond’s daughter) has since explained how the fictitious address came into being, which is not in any way related to the real address with the same name. 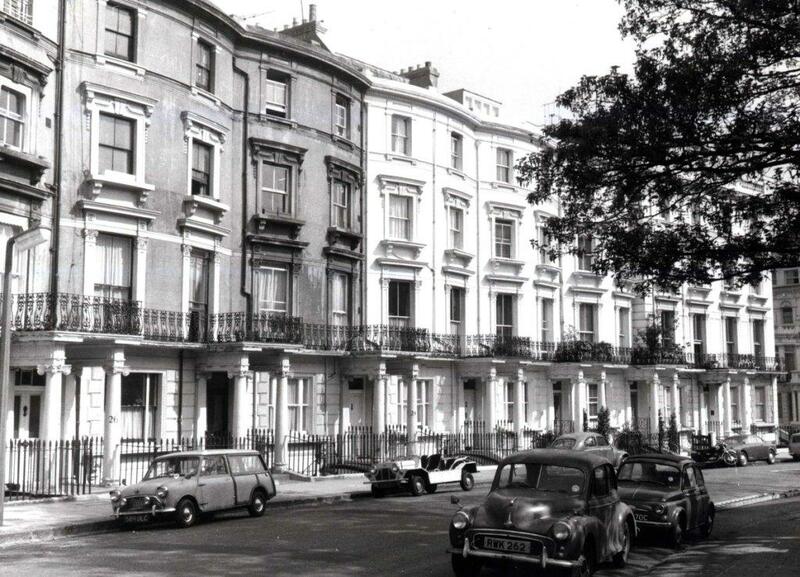 Michael Bond himself reveals in his autobiography that number 32 Windsor Gardens was “in my mind’s eye Lansdowne Crescent – a quiet street of rather grand houses off Ladbroke Grove and close to Arundel Gardens where we lived.” Imagine my surprise at the revelation! I too was under the same misapprehension as everyone else. Lansdowne Crescent, named after the Lansdowne area of Cheltenham, was built about 1842-1846. The houses are typical Victorian builds and here we have a 1970s photograph showing some typical cars of the day. We all have our own ideas about what fictional places look like when we are reading a story so I decided to look and see if we had anything interesting that might live up to my imagination. 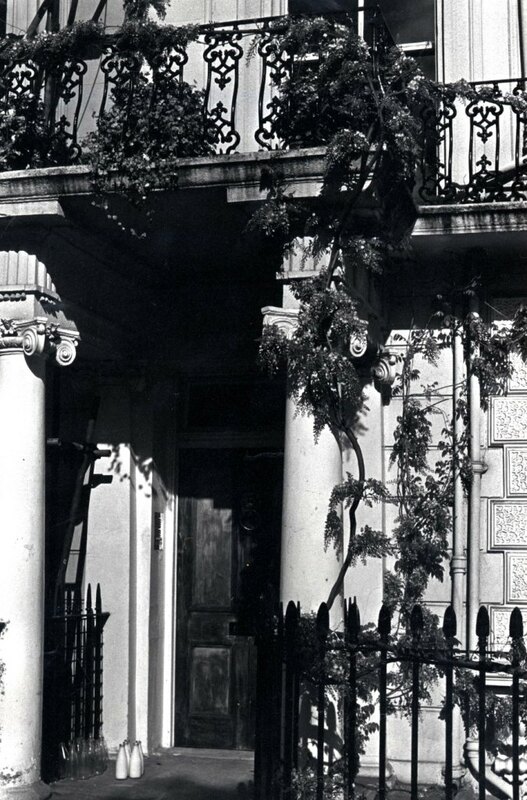 Above is a rather picturesque image of a house that exists along Lansdowne Crescent taken in 1979 although you would be forgiven for thinking this might be more of a 1950s film studio print. The dramatic lighting here must have been caught in the early morning. There are milk bottles still waiting to be taken in and (no doubt) breakfasts to be served. I could imagine the Browns living here under Mrs Bird’s scrutiny. I rather think Paddington might have been taken with the foliage growing around the house too. But, I’m a little ahead of myself. 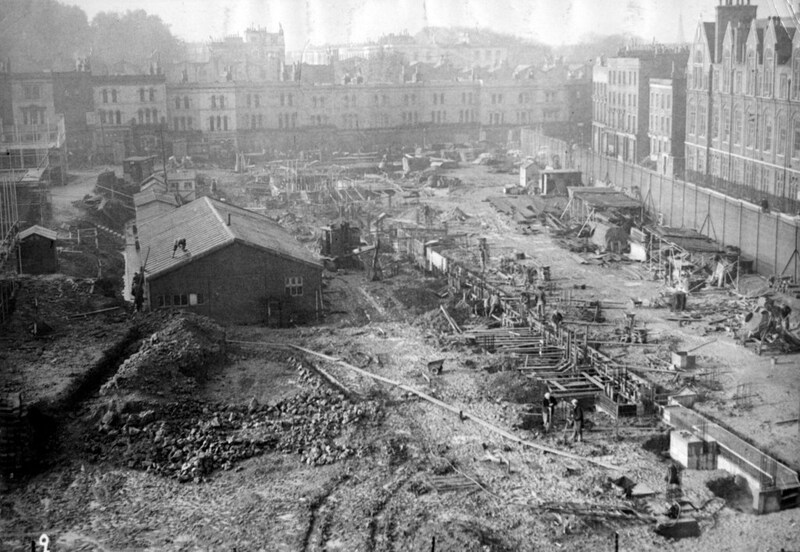 Geographically we need to start at the beginning and that is Paddington Station seen in the photograph below (courtesy of my colleagues at the Westminster City Archives). Why was Paddington Bear named thus, aside from the obvious? 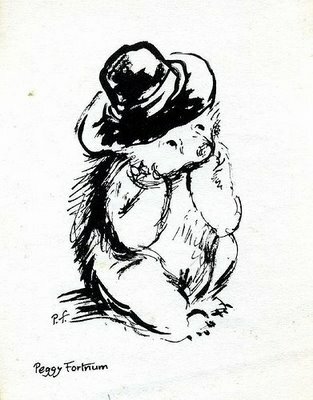 And so a bear was named and rescued by the Browns, “an immigrant in a strange country with no money and nowhere to go”. The strangeness of a place and the sudden upheaval of one’s life can be a daunting and frightening experience and yet perhaps there can be found, when we look closely, almost a haven or familiarity in the new friends we make and the new places we explore, depending on where we end up. 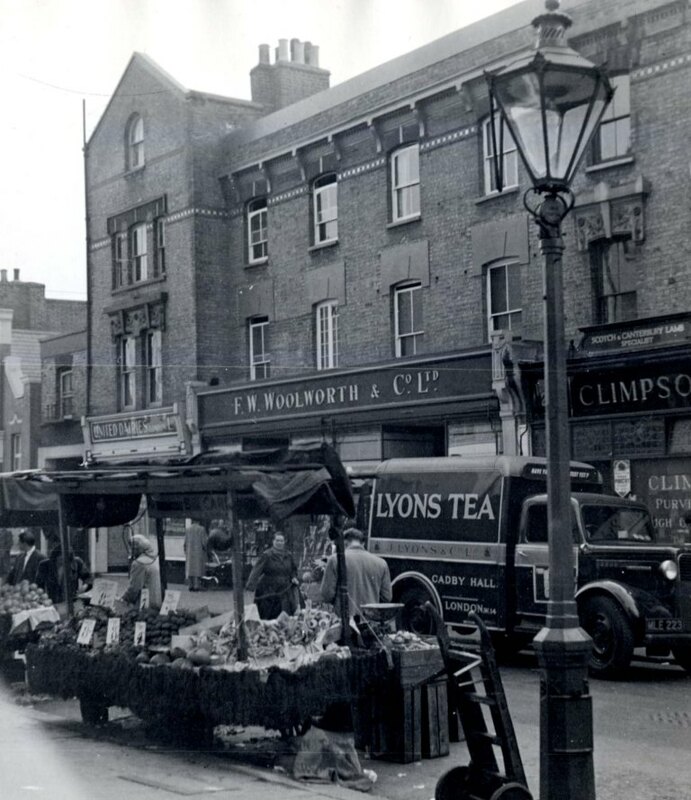 Which brings us to Portobello Road, a familiar haunt of Paddington’s, seen here in 1951; it has always been a bustling and diverse community selling everything from antiques, bric-a-brac, fruit and vegetables to fashion, household goods and street food. 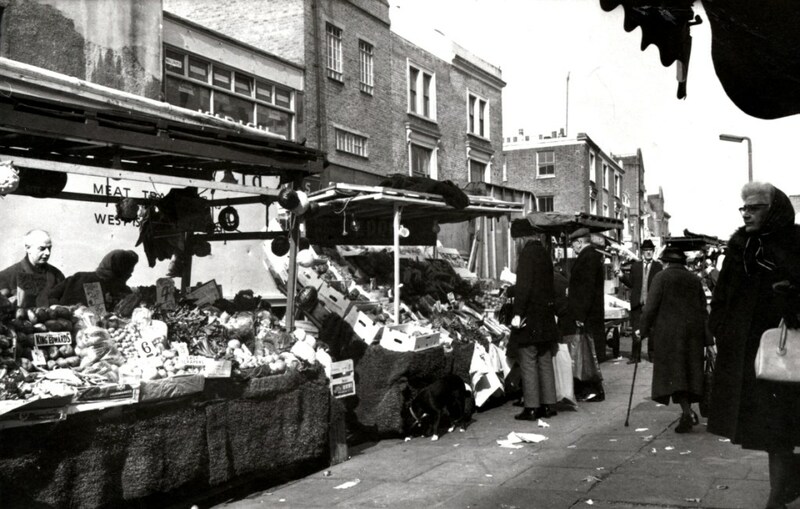 Indeed this year both Portobello and Golborne Markets celebrate a 150 year anniversary. 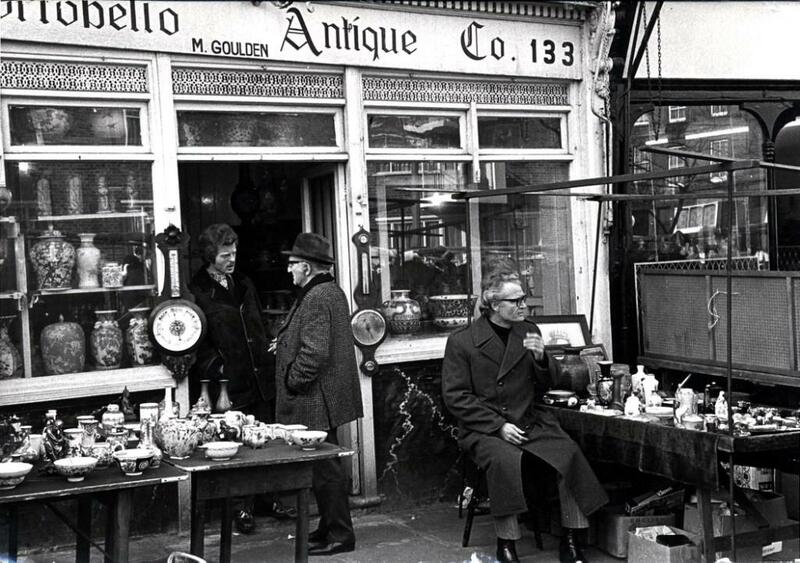 Perhaps his antique shop resembles this one? Everybody sells something a little different and people are always on the lookout for something unique. This gentleman appears to be about to pay for something but we have no idea what. 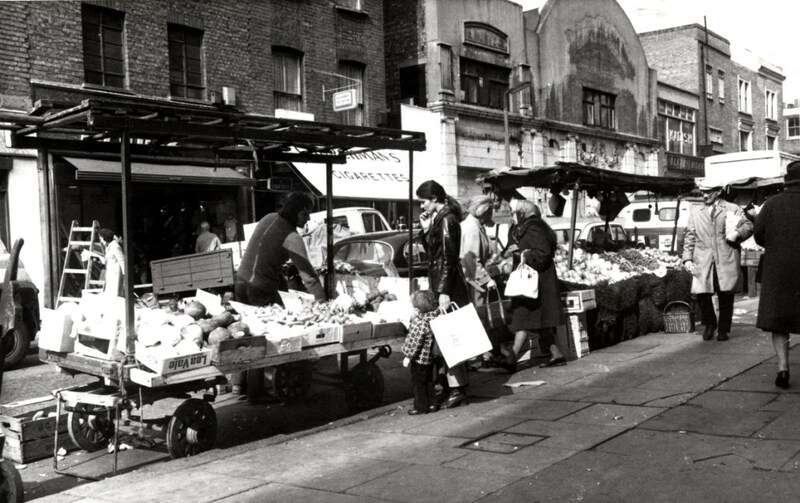 The market also has many fruit and vegetable stalls –that was its main function before the antiques moved in. 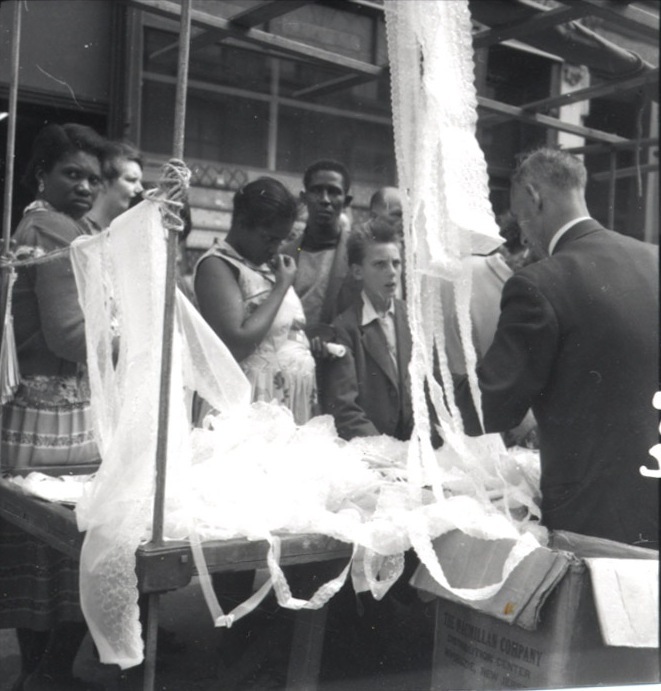 Back in the 1950s shopping in markets was where the average shopper would buy things. 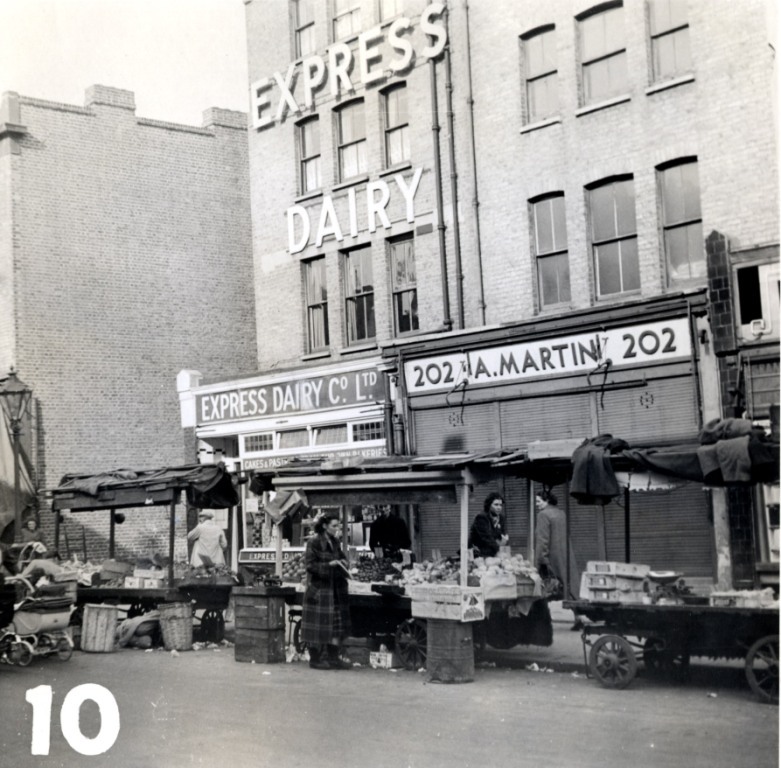 The concept of supermarkets was not yet realised to a great extent. 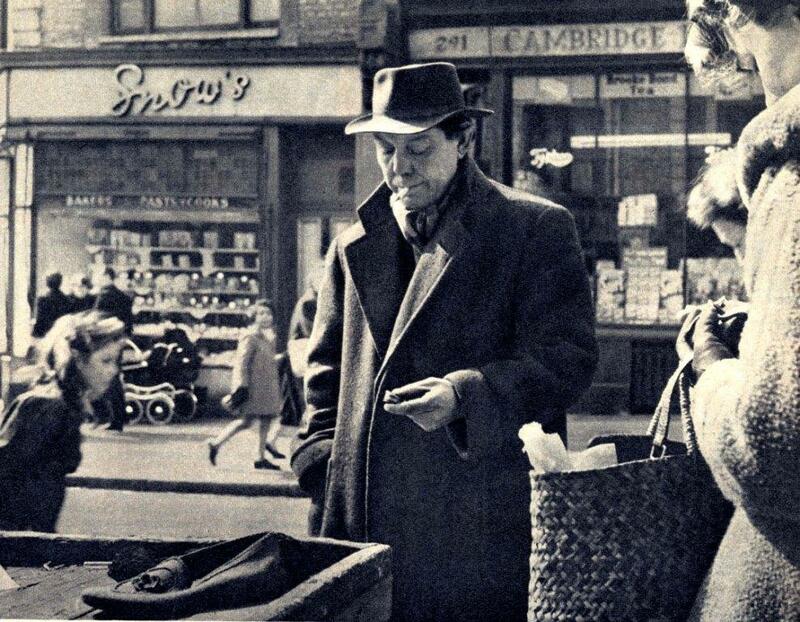 Everything was pennies and shillings, pounds and ounces and people knew each other by name. That may still be the case to a degree but times have definitely changed. Paddington certainly seems to enjoy doing his daily shopping in the market – not sure what he would think of a large Tesco store. 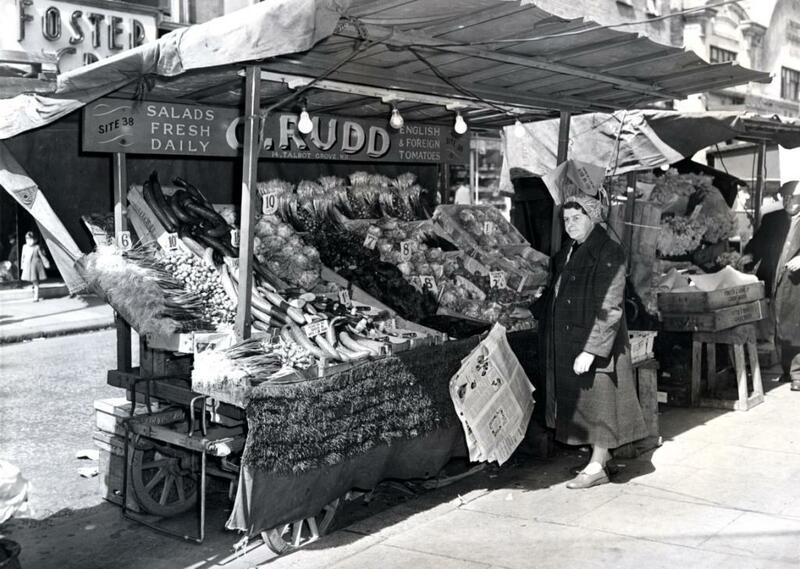 This unnamed gentleman also has a fruit stall with what appears to be a fish stall next to him (1958). I rather like his sign, shaped like individual oranges saying JAFFAS on the top of the stall – the oranges and not the cakes I suspect – seems to be the most popular orange variety sold in Portobello. I almost wish these photographs were in colour. The colours on that stall would have been very vibrant. A Lyons Tea van with a fresh delivery. Paddington does like his buns after all. 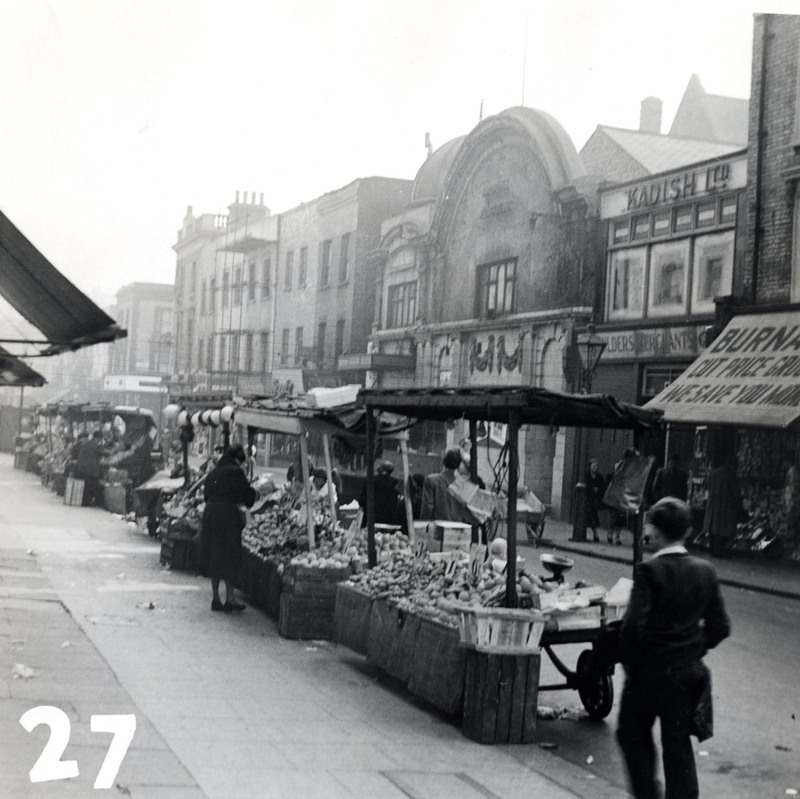 In the background is 191, Portobello Road, home of the Electric Cinema, first opened in 1910. 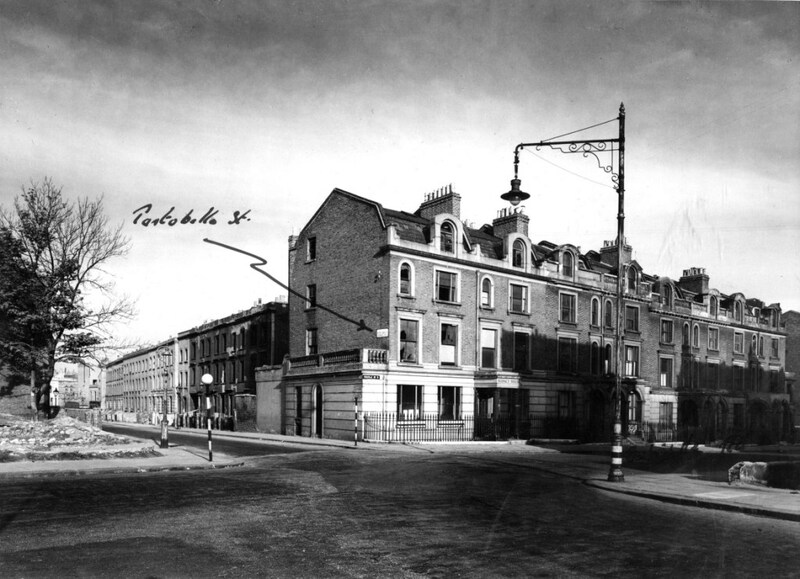 In the London Post Office directory of 1958 it is listed as The Imperial Playhouse having been renamed in 1932 during one of Notting Hill’s less salubrious periods in history. It went back to its original name in the late 1960s and despite its precarious existence it remains an iconic survivor. Few original cinemas remain in London now, not least those of the West End which are succumbing to the indignities of redevelopment. How much has changed since Paddington Bear’s original debut! And yet, modern technology has brought him to life on the big screen premiering him in Leicester Square for the first time. Our bear from Darkest Peru has come a long way, and even though he has very much become something of a universal bear despite his being quintessentially an English bear, I personally think of him as a West London bear and I almost half expect to see him traipse down the Portobello Road with his trolley in search of some tasty buns for his elevenses with Mr Gruber any day now. 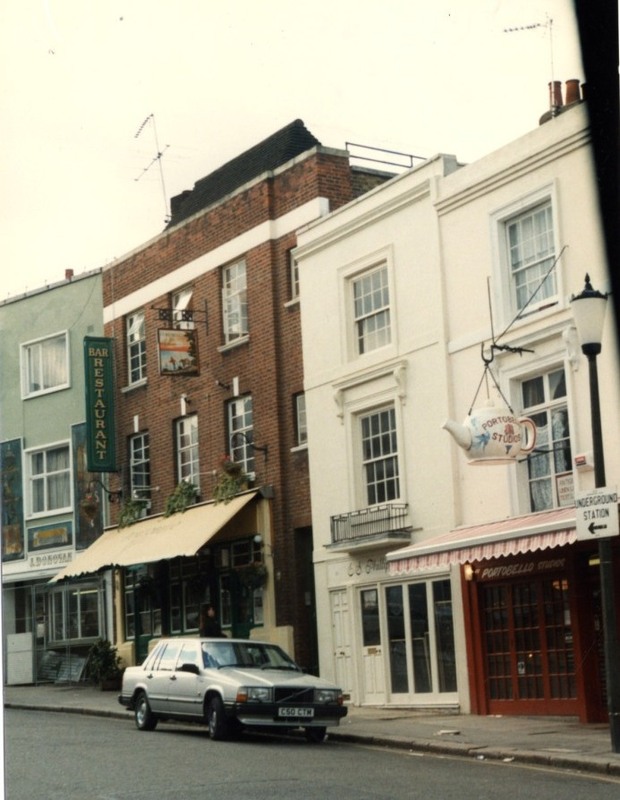 The post itself is not about any one specific place; it’s more of a geographical jaunt following some of the places we know Paddington Bear has frequented and still does by all accounts: a fictional character set in real surroundings given one or two imaginative alterations here and there. And here I conclude my rather whimsical homage to Paddington Bear. My thanks to Isabel, and apologies because I still haven’t worked out how to add an author on WordPress. This post kills two birds with one stone for me. 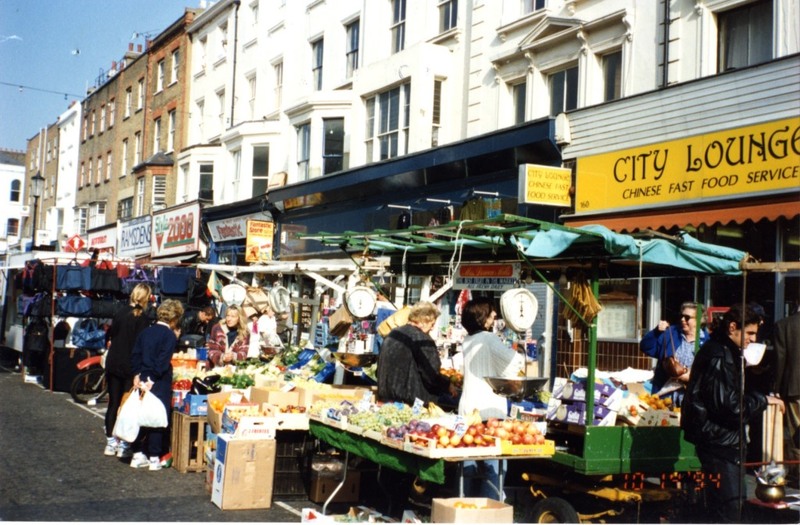 Not only do we get Paddington but also the Portobello Market which celebrates its 150th anniversary this year. You can expect more on the market in the months to come. I know lots of readers don’t live in London but forgive me a bit of advertising. For Holocaust Memorial Day this year we have an event on January 27th at Kensington Library featuring historian Roger Moorhouse. Follow the link for more details. Roger gave an excellent talk at our London History Festival in November based on his book “The Devils’ Alliance: Hitler’s pact with Stalin 1939-41” so despite the sombre subject I can highly recommend this talk especially in the light of recent events. 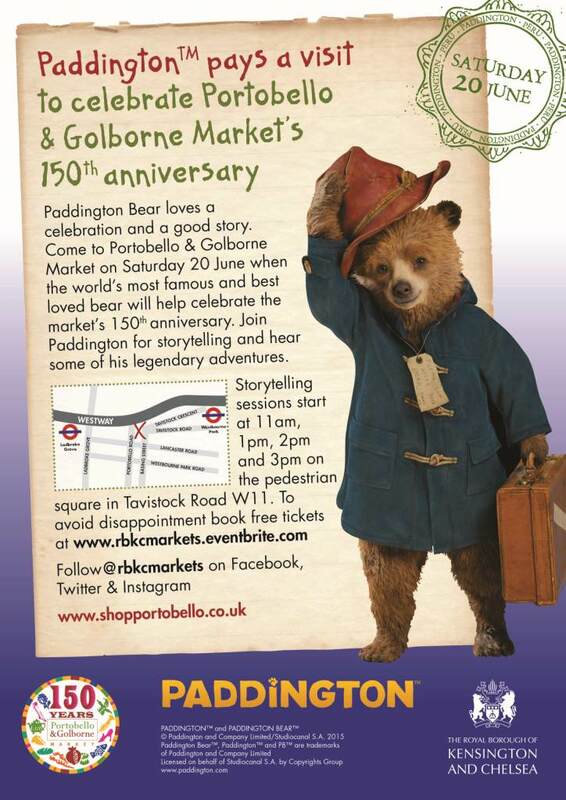 There is a Paddington related event in Portobello / Goldborne market on June 20th. See below. 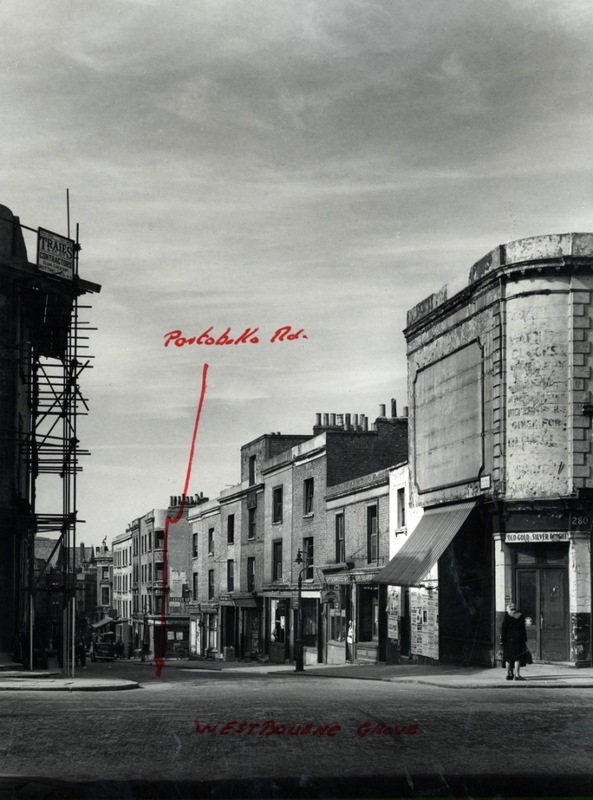 This is Portobello Street (formerly called Bolton Street) in February 1945. You won’t find it on maps today. 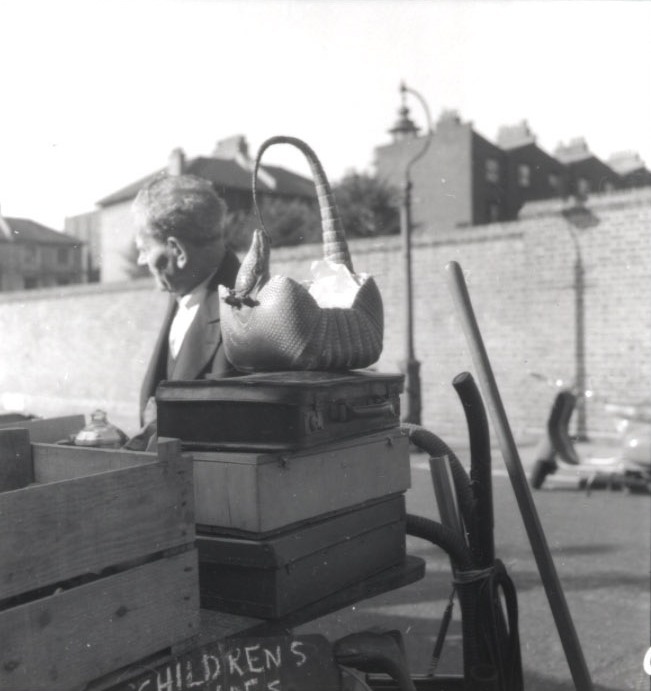 Your eye is drawn to the horse and cart, still commonplace in London at that time. But look up from the cart at the almost entirely torn down political poster on the wall where the big caption “Labour gets things done” survives. This was of course months before the election of 1945 which resulted in a landslide victory for the Labour party. Housing developments in Kensington were not a direct result of the election. 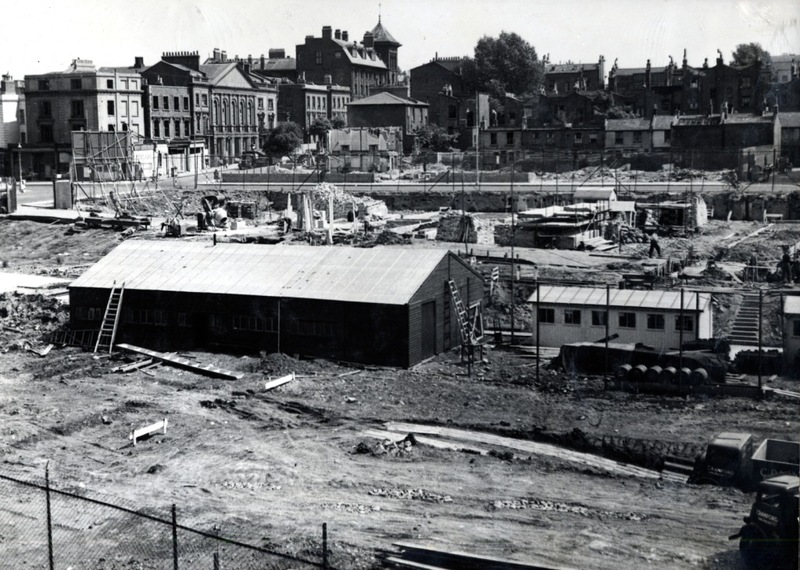 There was a huge impetus for new housing after the damage and dereliction left by the war. 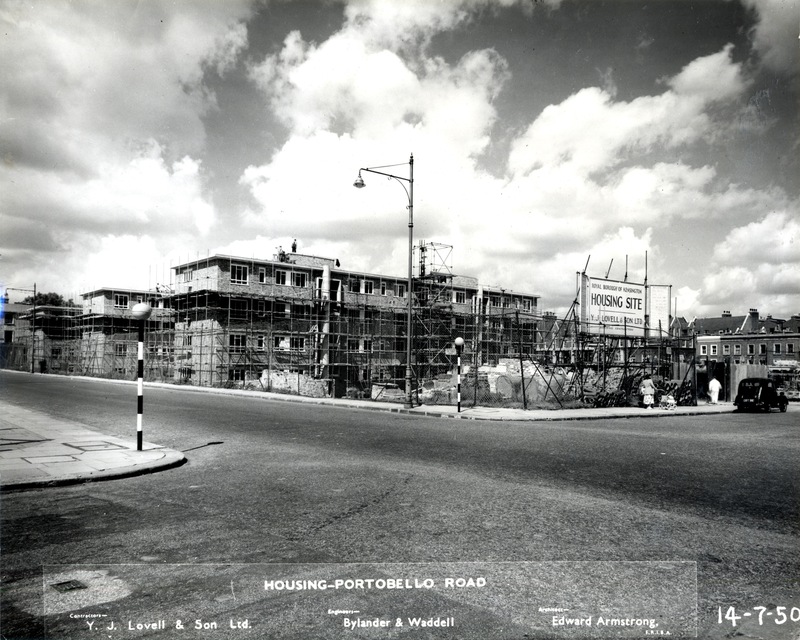 One typical development was the plan to demolish the whole of Portobello Street to make way for a new housing estate. 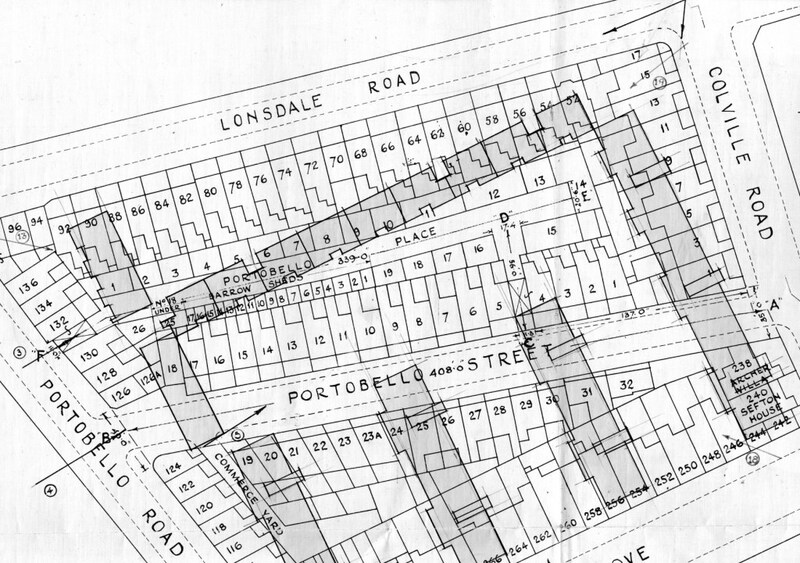 This map, overlaid with the new buildings shows the extent of the new estate. The building work has only just begun and just like with modern projects the builder’s hut is the first thing to be constructed. This one looks rather more substantial than the prefab units of today. 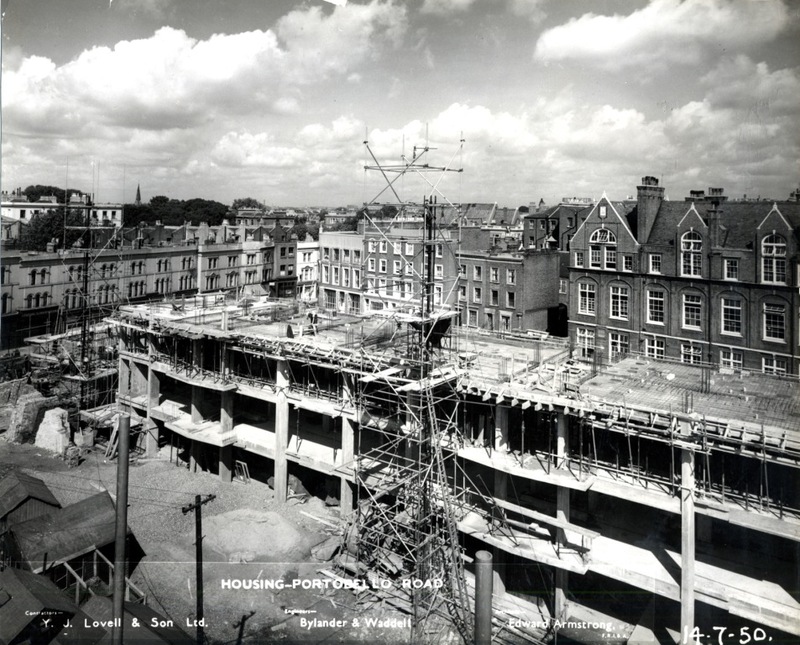 Looking at the site from another angle you can see the tower of the Convent of Our Lady of Sion, now converted for residential use and known as Thornberry Court, and nearer to the building site the classical front of the Methodist Chapel, now demolished. 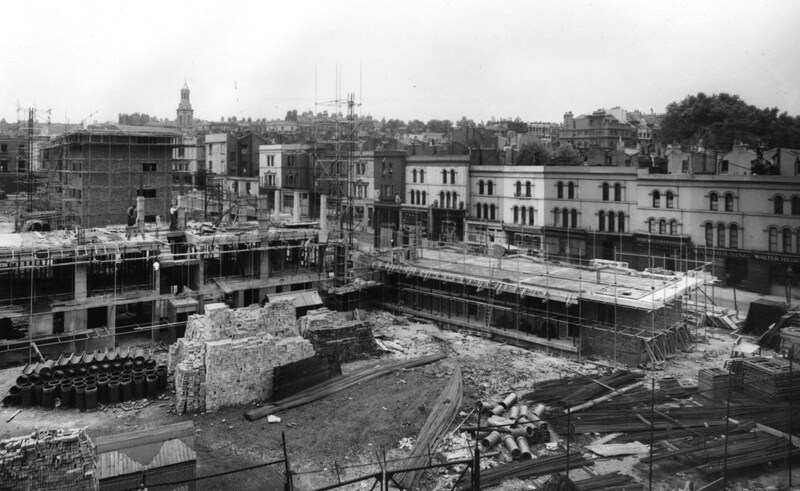 The buildings on the other side of Westbourne Grove have also been demolished. 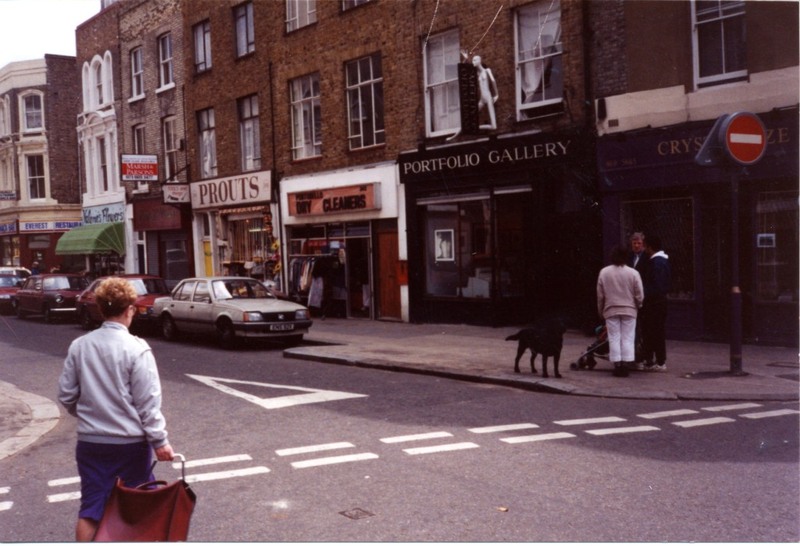 This section of Westbourne Grove was originally called Archer Street. 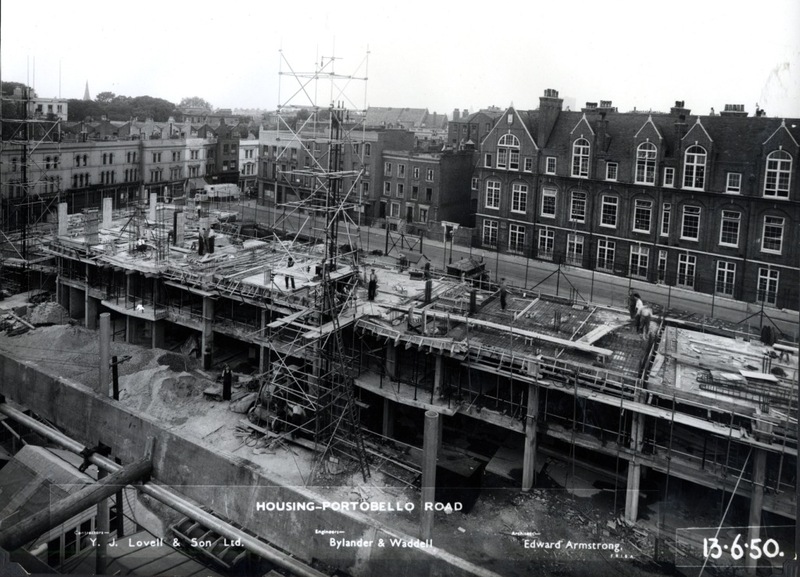 In the picture below you can see more of Lonsdale Road and Colville School. 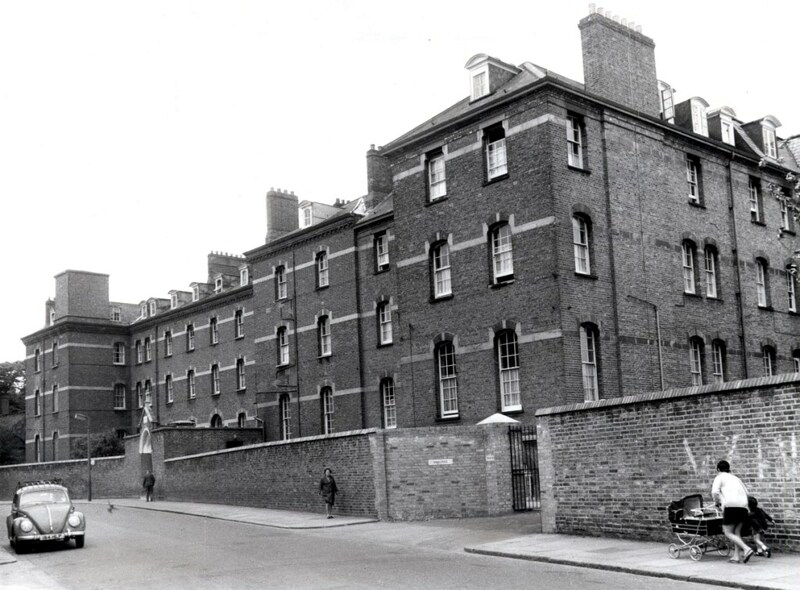 That section of street used to be called Buckingham Terrace (and before that Western Terrace), and the school known as Buckingham Terrace School. Here is a slightly different view of the same side of the new estate, showing the entrance to the school and what looks like a removals van. The tower of All Saint’s Church in Talbot Road is in the distance. This picture shows the east side of the development. You can see the estate taking shape. 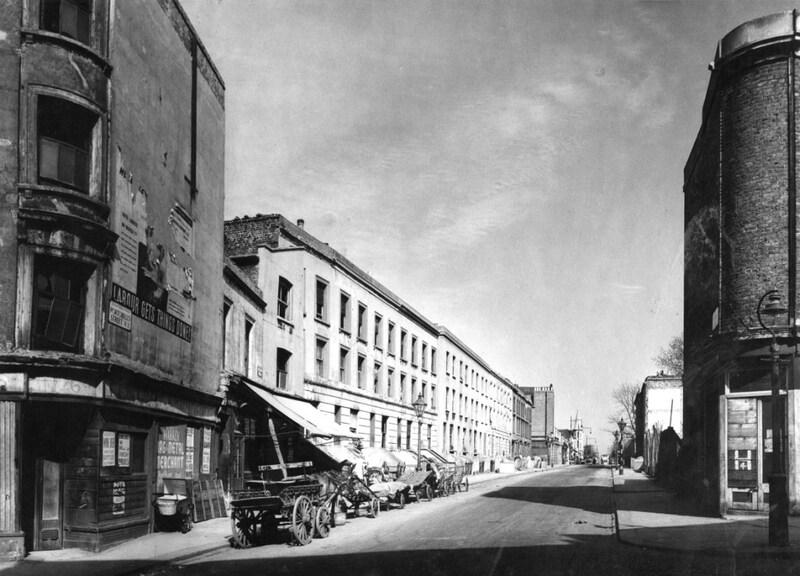 The street in the foreground is Denbigh Street. 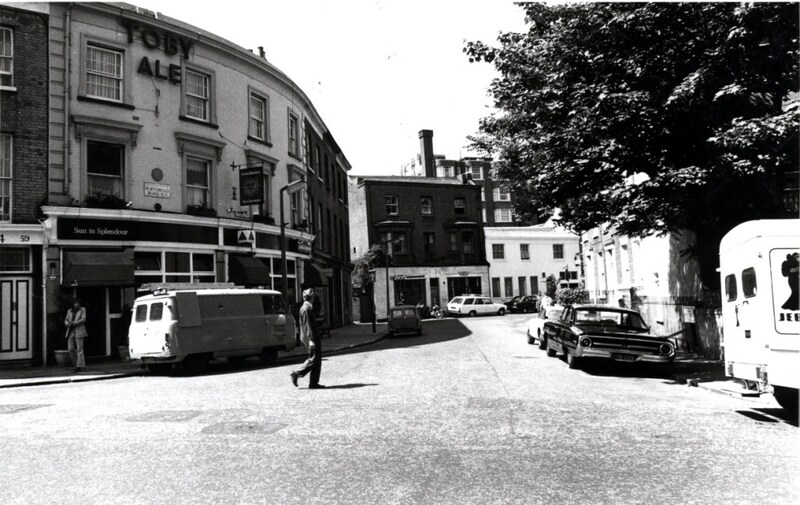 The bus is parked at the corner of Westbourne Grove. 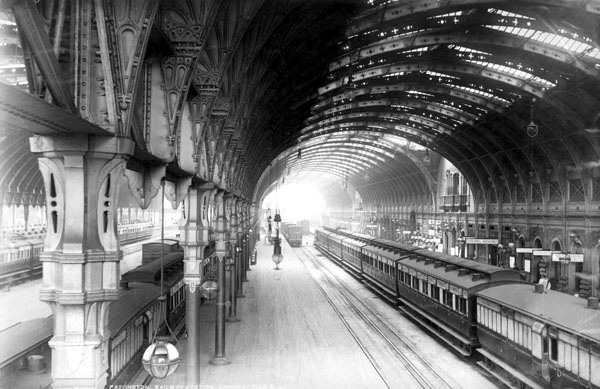 (Not to mention the bowler hatted Man from the Ministry standing there). 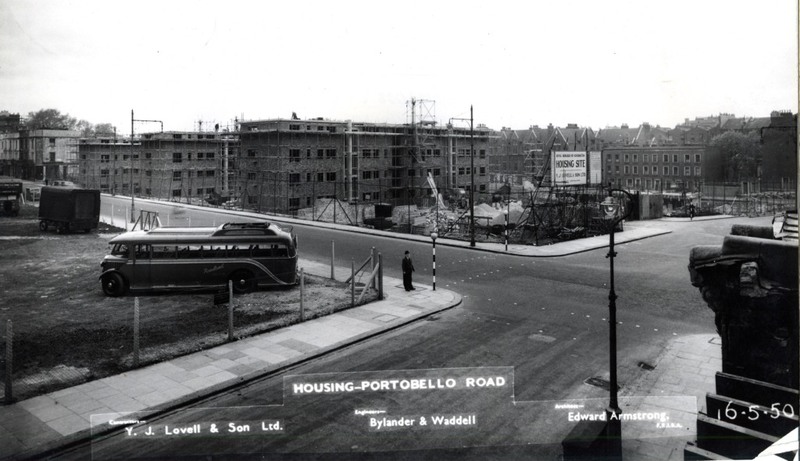 Colville Street carries on from Denbigh Street and Lonsdale Road can be seen in the background. 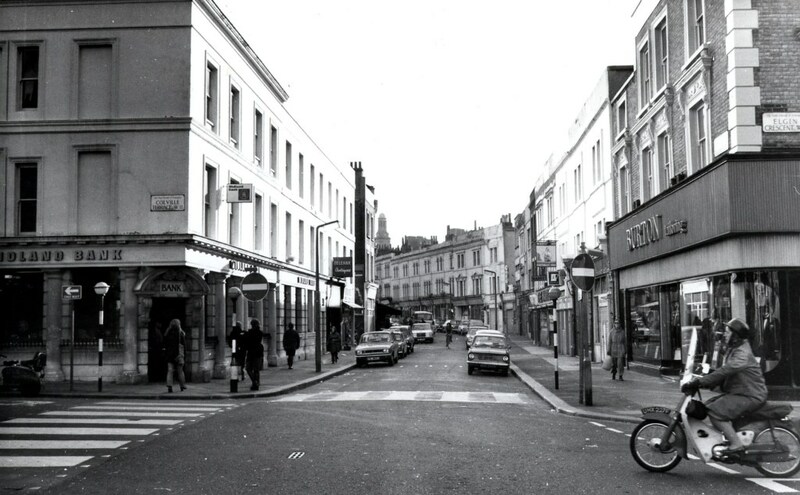 Portobello Road itself, running across the back of the picture with the tower of St Peter’s Church, Kensington Park Road just visible, thankfully for the modern viewer. 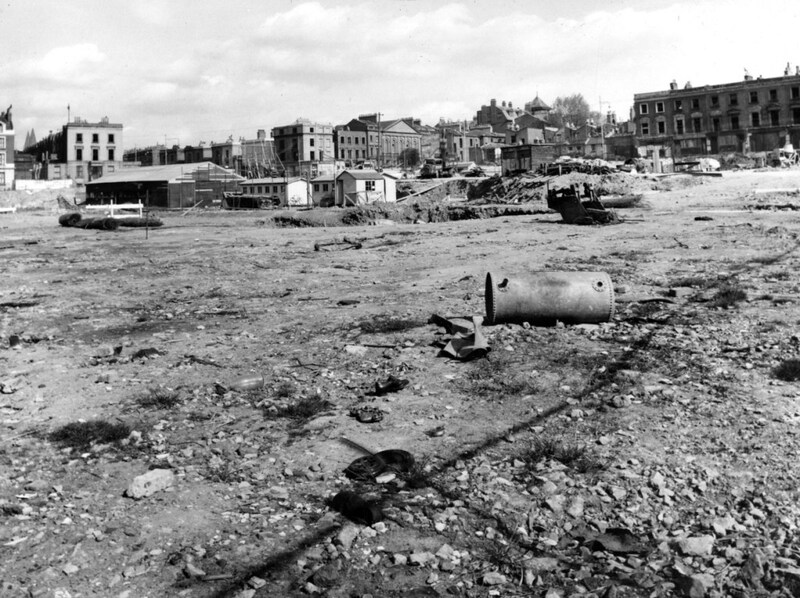 The previous pictures of the site were taken in May and June of 1950. The last three are all from July of that year. The housing blocks get taller. 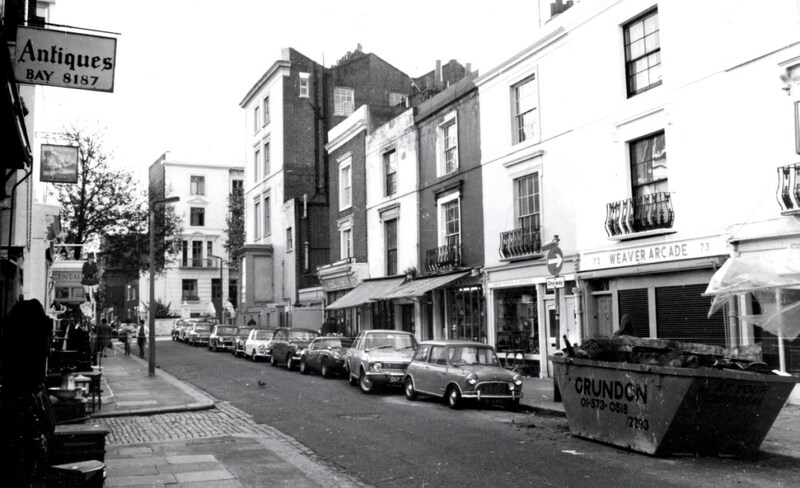 A number 15 bus can be seen on Westbourne Grove. Here is another view of that corner. The estate is almost finished. 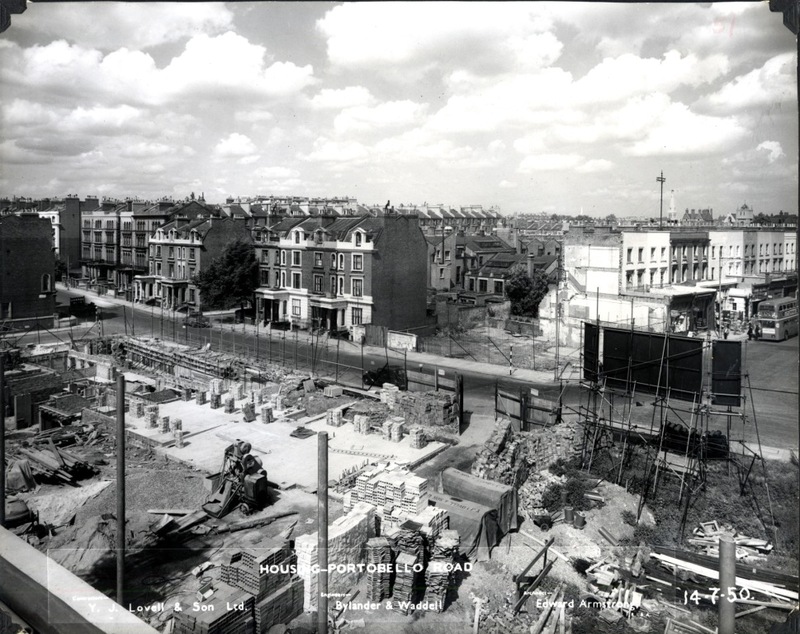 If this selection of camera angles, street name changes , demolished and still existing buildings has left you confused let’s take a final look back at 1945. 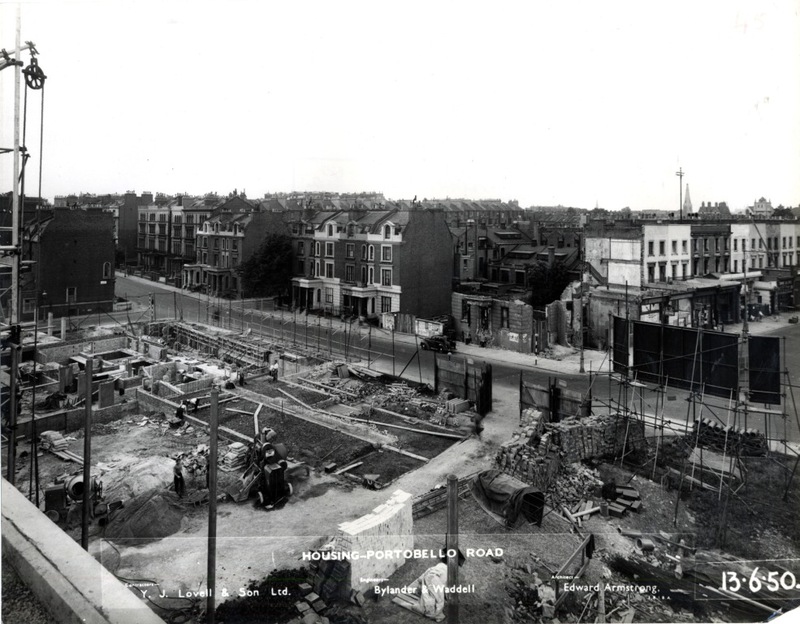 Below is a view looking down Portobello Road in 1945. 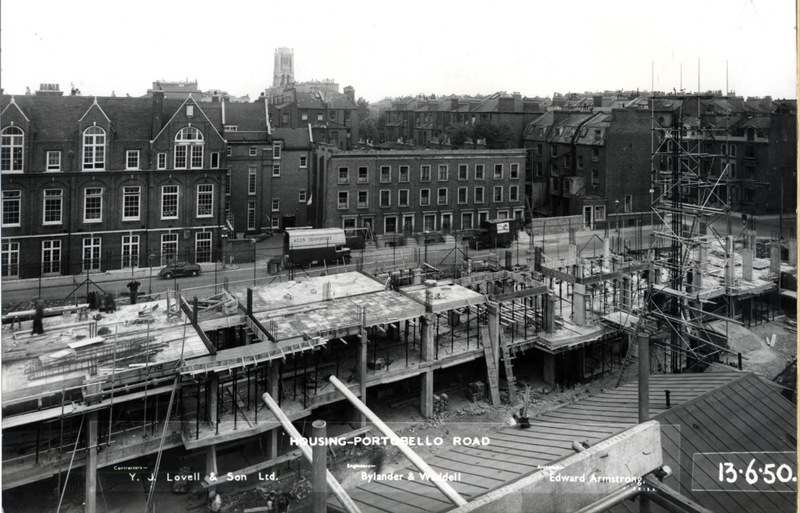 Once again the planner’s pen is at work marking the end of Portobello Street. A woman stands on the corner looking down the street perhaps unaware that everything behind her is marked for destruction, and new housing. As you can imagine although this post is economical in terms of words it had a high level of difficulty as far as accurate captions were concerned. Local resident and historian Maggie Tyler helped me with orientation and identification of streets and churches but any errors are my own. Current and former residents of Portobello Court may spot things I’ve missed. Corrections and comments are welcome. 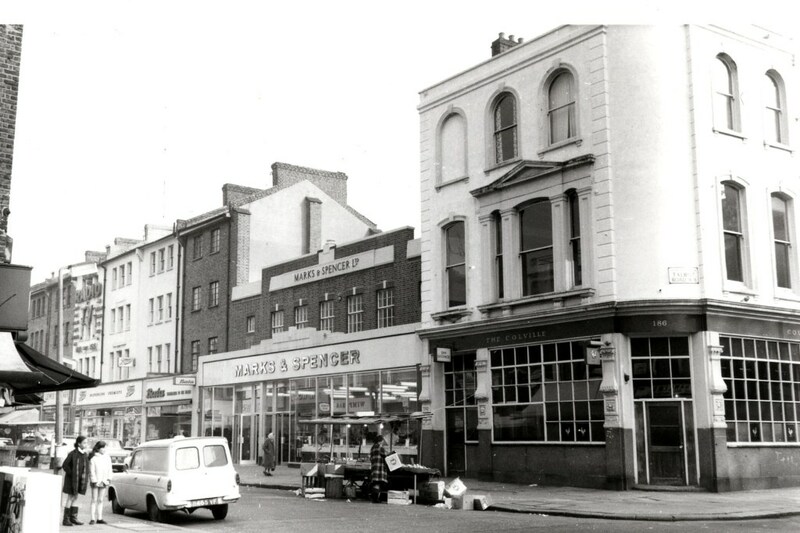 I had intended to include a 1970s picture from our photo survey to show the completed building but when I looked at the set of John Rogers photos of the Kensington part of Westbourne Grove I decided they deserve a post of their own, which will be coming soon. 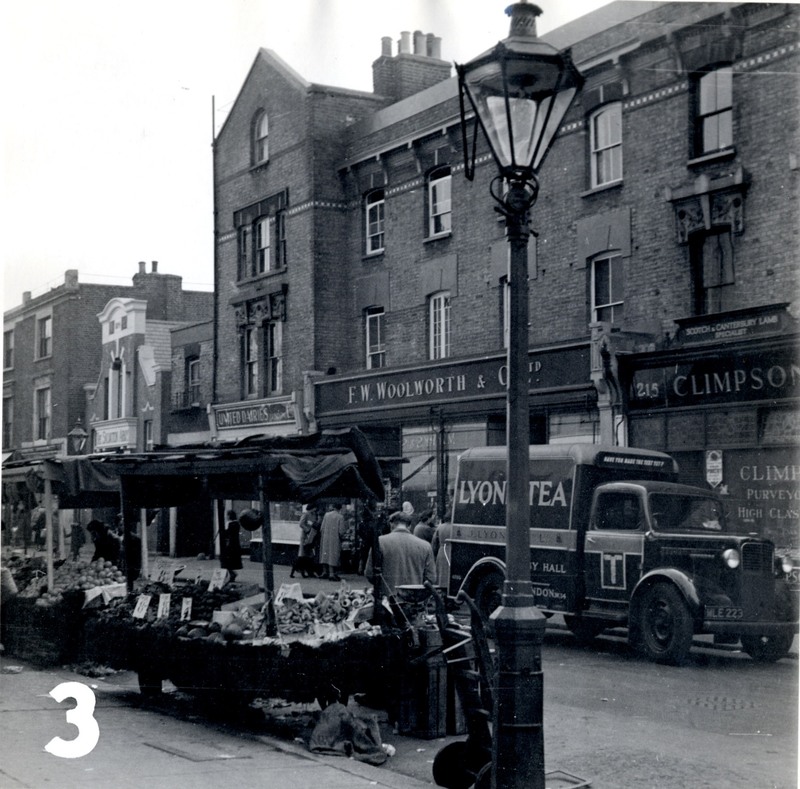 Having done posts on Portobello Road in the 1950s and the 1970s I was keen to continue the story so I was pleased when we recently acquired a large number of photographs of streets in the borough which our Planning department no longer needed. 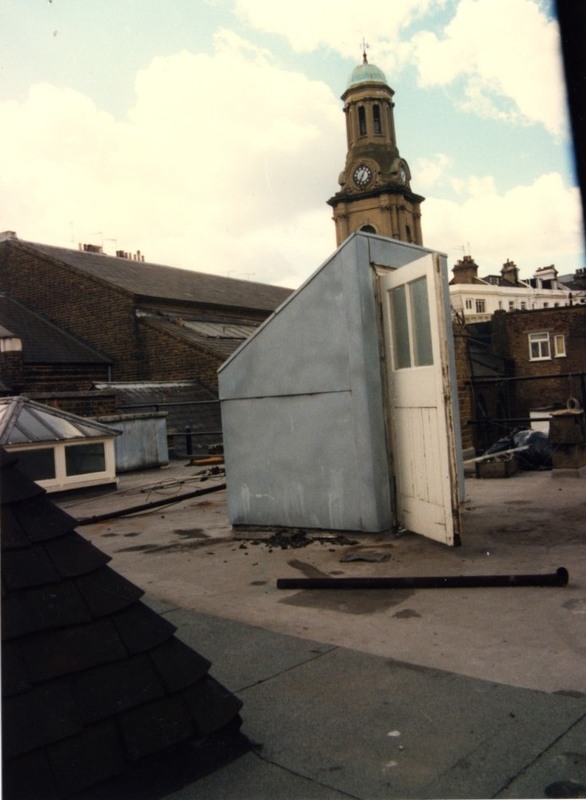 The photographs were all taken in connection with planning applications, so they had no artistic or historical intent. And of course there was no intention to cover a whole street or district or capture an atmosphere. Their existence depends purely on someone’s desire to make changes in a building. 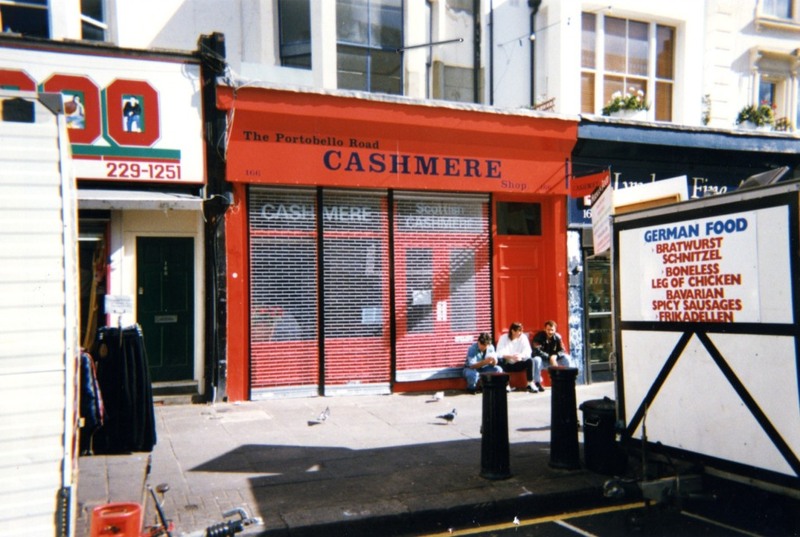 I looked through the three folders devoted to Portobello Road and picked out images I liked, not expecting to see any kind of story, thinking I would simply see shop fronts and stalls, some of them now gone, some of them still here. But what does emerge is a feeling for the decade, a decade which doesn’t seem to my recollection at least to have a distinctive identity. 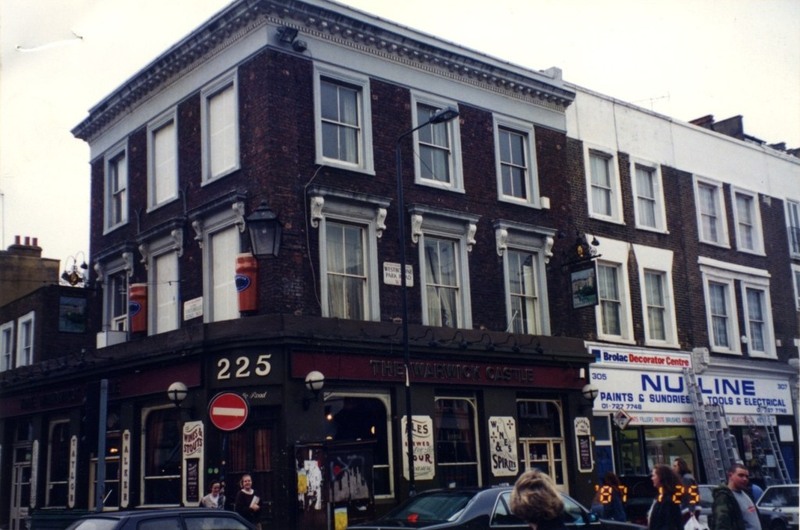 Number 265 in 1990 and 299 in 1991, properties in need of improvement after the effects of the 1980s. See the handwritten notice about DHSS estimates on this locked up property. But remember these are the properties someone wanted to improve not examples of how the street as a whole looked. 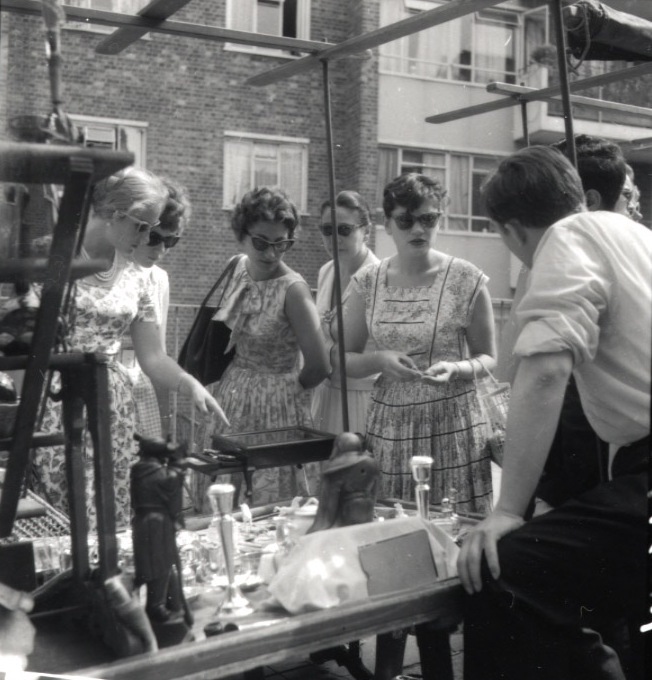 At the same time the commercial life of the market continued and some businesses were looking prosperous. The collection has a few composite pictures made up of several individual photographs put together to form a larger image. See the comic shop Fantastic Store at 166 also visible in the picture below. The Warwick Castle has been at 225 since the 19th century. Further up the road another long established (since 1974) institution carries on trading. I sometimes think the 1990s were recent times, until I realise they were in another century and there’s more than a decade between then and now. Those years are retreating into history. Some things of course don’t change too much. And on Saturdays you’ll still see a crowd of people making their way down the narrow street from the top of the hill to the bottom. Thanks to all the anonymous photographers and above all to Michael Robertson of the Planning Department. 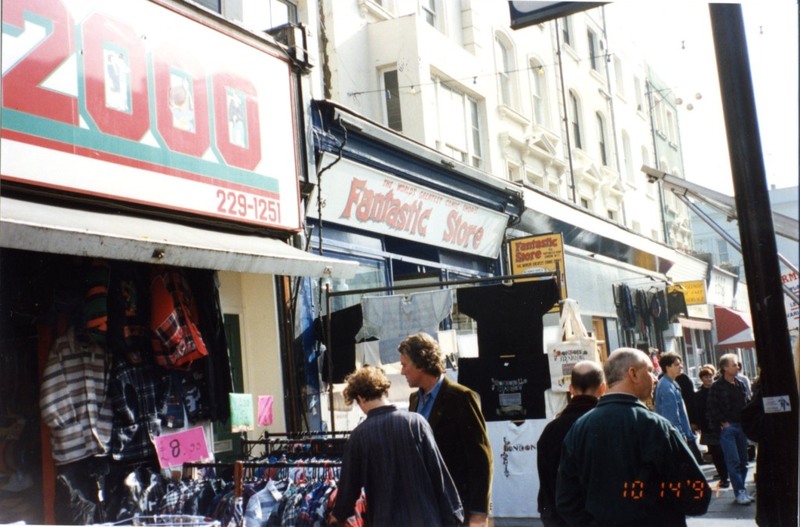 Our last visit to the Portobello Road (see link in column two) proved to be quite popular so we’re returning there this week after a gap of twenty years or so. Now we’re well into what I think of as living memory. I made the point in the fifties post that some of the images could easily have come from the thirties rather than the fifties. By contrast some pictures from the seventies look almost contemporary to my eyes at least. The devil of time is as always in the details. No Madam, I’m not going to go on forever about the nature of time and memory. Just to say that for me at least the concept of the present has expanded as I get older and it’s not too much of a stretch for me to consider any time in my adult life as the present day even though for some the early seventies have been consigned to the dustbin of history. You can stop yawning now Madam. 1973’s incarnation of the Sun in Splendour looking a little down at heel compared to the way it looks today. 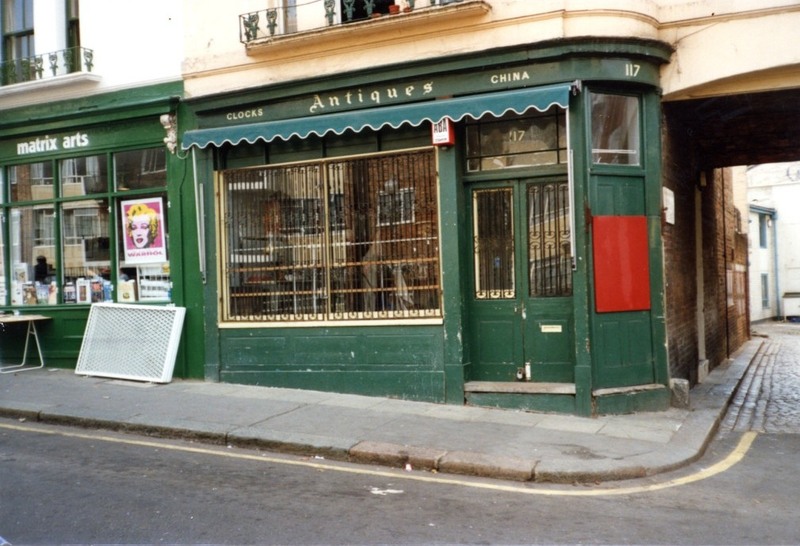 Pictures of Kensington or London in general from this time have some common characteristics. 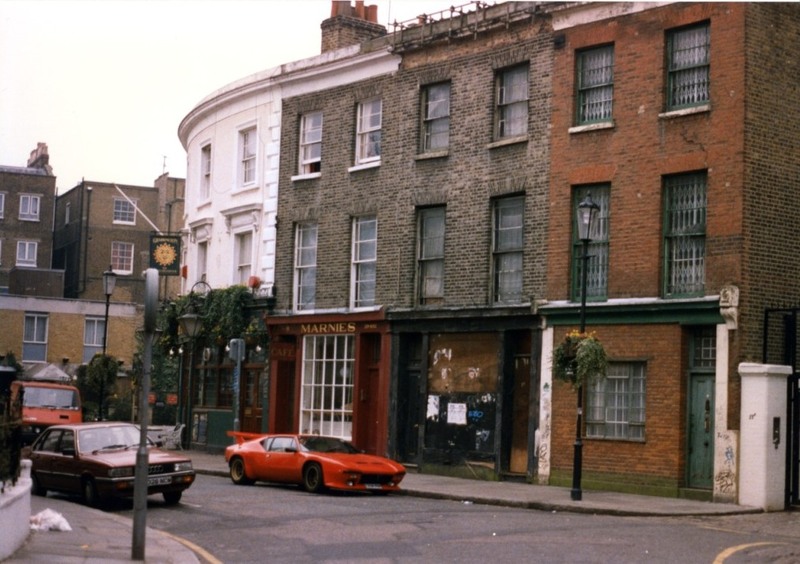 They look a little less crowded than modern streets, the cars look slightly alien (is that a Ford Frontenac on the right? 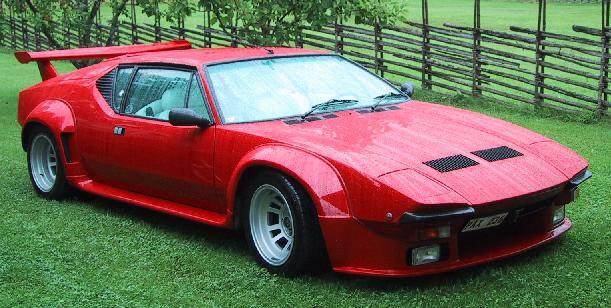 Suggestions from car enthusiasts welcome) and of course you can imagine Regan and Carter dangerously swerving across your path in their Granada. 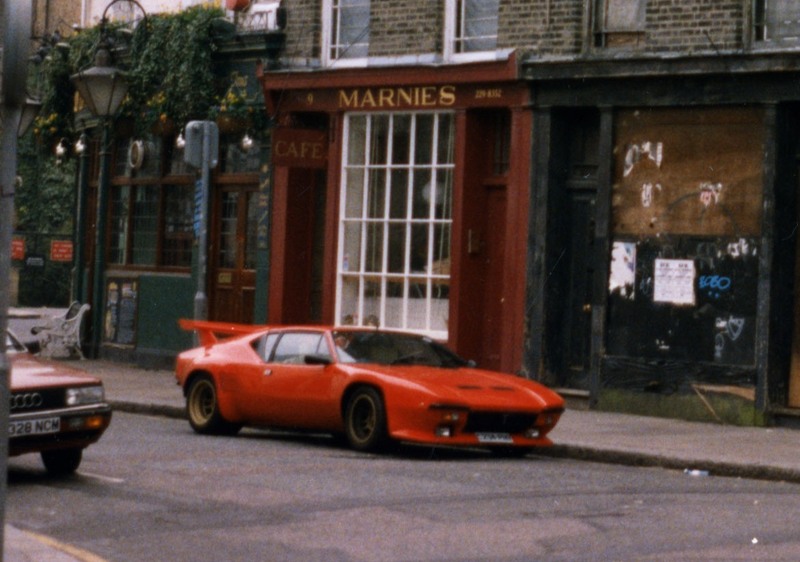 Or Bodie and Doyle in a Capri for that matter. 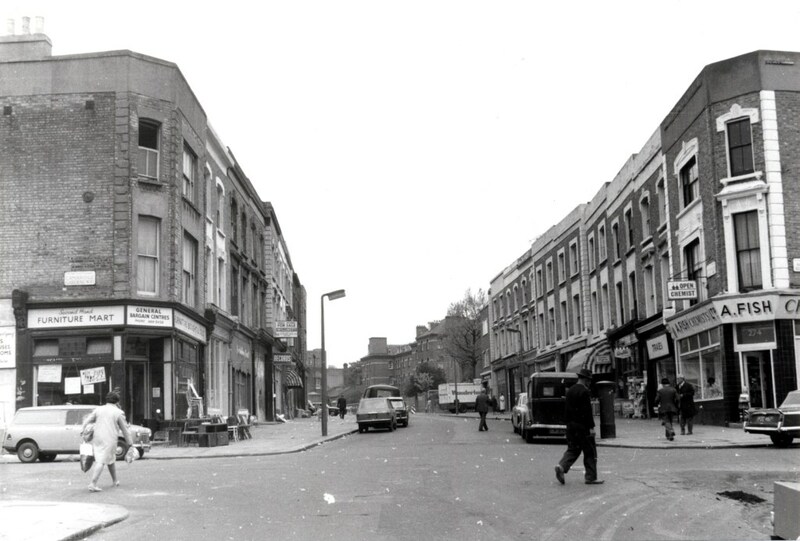 North Kensington was a favourite TV location at the time. The road is narrow at this point. 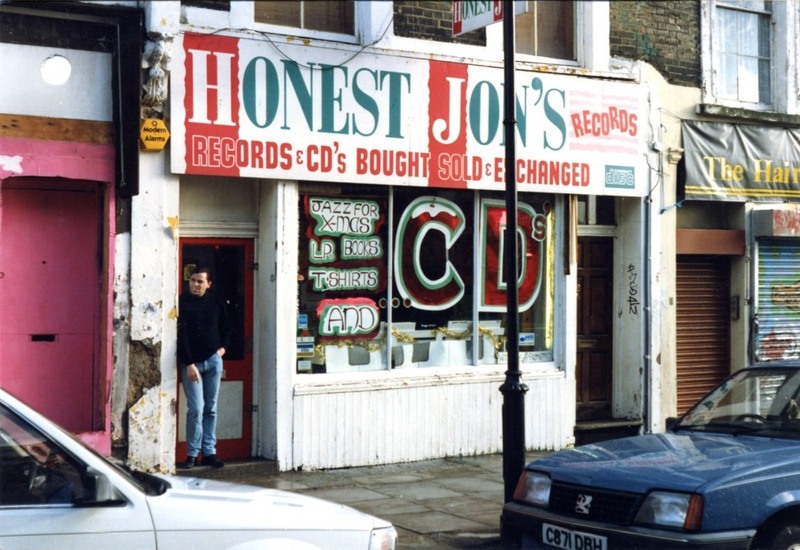 There were fewer shops and almost no stalls, although I recall one shop with hip merchandise on sale outside including boxes of bootleg LPs with their all white cardboard sleeves. 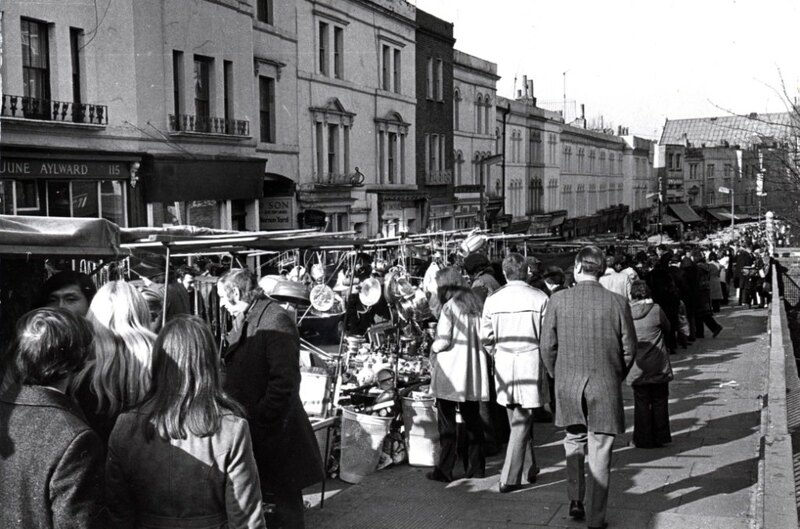 The market itself didn’t really begin until you crossed Westbourne Grove and the slope down the hill got steeper. 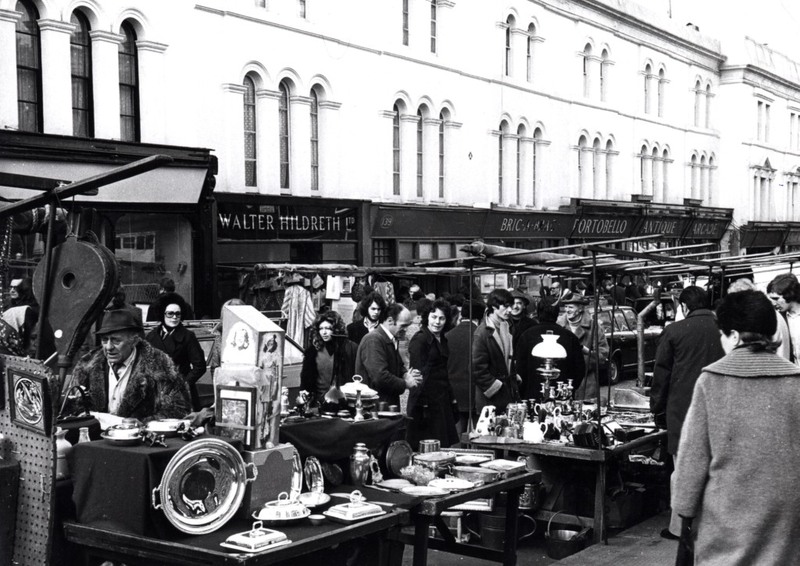 This was and still is the antiques sector with dozens of stalls and the many arcades. You can just see the spire of St Peter’s Church in the distance. 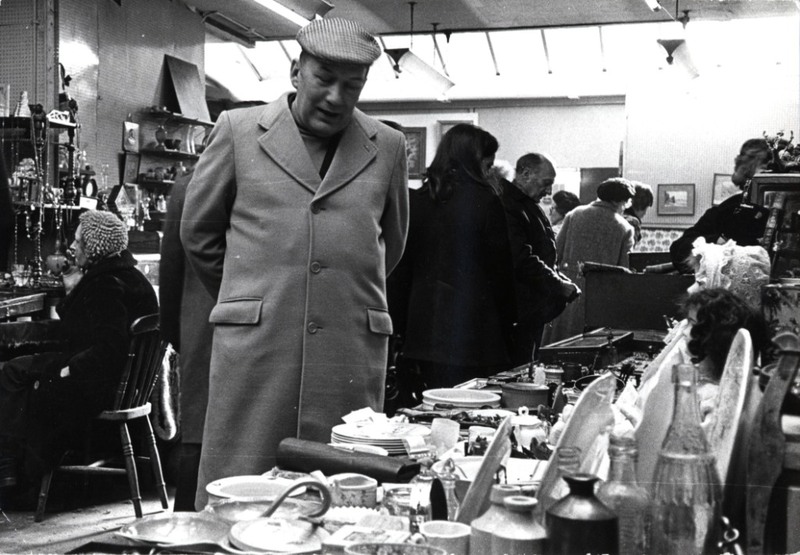 As the antiques stalls thinned out you began to see ordinary high street shops and family businesses. The stalls start to become devoted to food. The Electric Cinema is visible in one of its periods of closure. 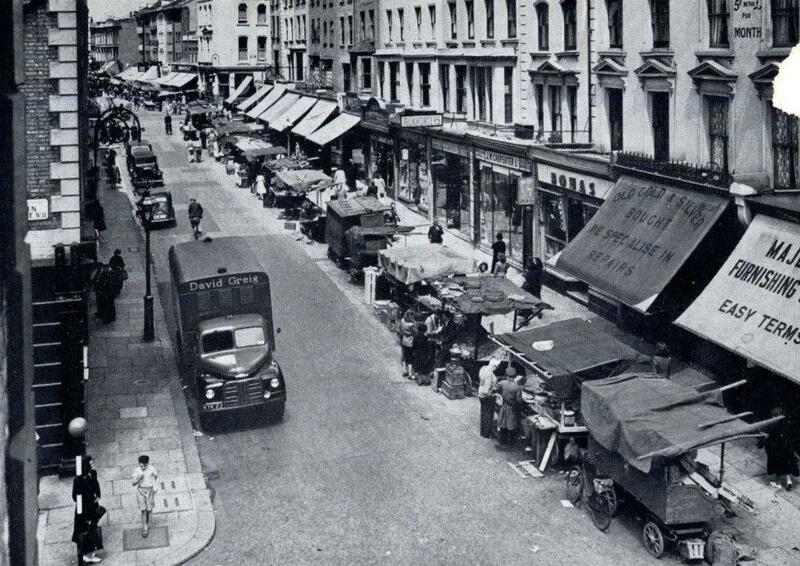 The food market wasn’t confined to Saturdays but there were some weekdays when there were fewer stalls. Eventually you came to the railway bridge and the Westway and a final set of stalls with books, second-hand goods of all kinds and yet more bootleg LPs. I don’t have a picture of this area in the same photo survey set as the others. The photographer was working on weekdays and there wouldn’t have been much to see at that point. But in my memory the open area beyond the motorway seemed enormous, full of people. It was the epicentre of something although from this distance in time I can’t say what. I looked at the area on Google Street View this afternoon and it was much smaller than I remembered. Its bulk is disconcerting after the smaller scale of the market. At this point we seem to have taken a further step back in time. 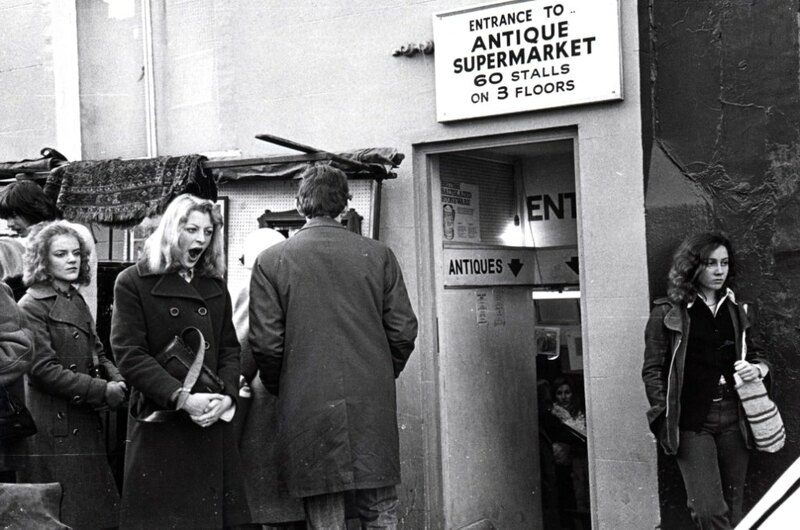 I would never have made it this far on my Saturday afternoon trips to Portobello in the 70s. 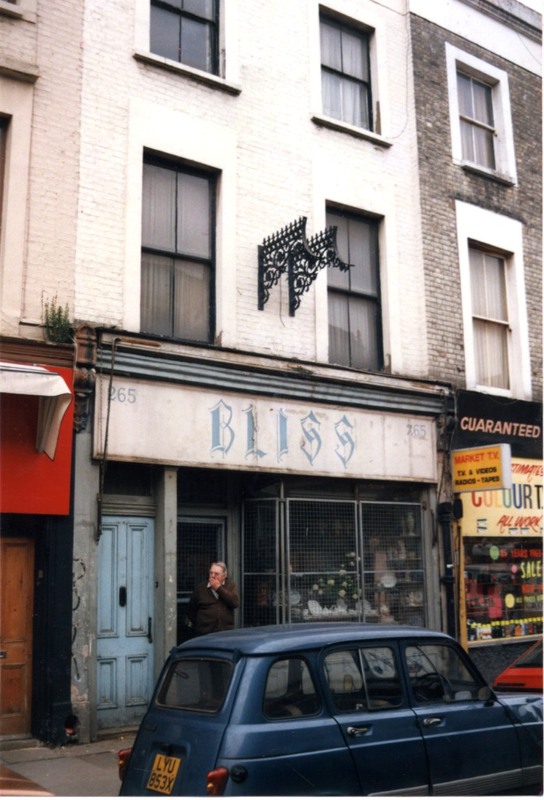 Somewhere around the Westway we would have found our way to a bus stop and either got the 52 back up to Kensal Rise, or the 31 making its way to Camden Town – in those days one of London’s most tortuous bus routes. Here’s one final picture to get us back to the70s. The serious business of selling antiques which is both glamorous and seedy. So congratulations to her. If you recognize any of the people featured in the blog I’d love to hear about it. I’ve met a few people who’ve found their way into the Local Studies collection and I always like to hear about them. Especially the three women in the first picture this week. Any ideas? I was born in the 1950s so although I can’t remember much if anything about that era, because I was alive then it doesn’t seem to me like it should be described as the historical past. More like an annexe to the present. But looking at these pictures from 1958 demonstrates how far away from us the 50s are. No internet, no mobile phones, almost no television by comparison with today. Only a few subtle differences in this photograph could place it twenty years earlier. 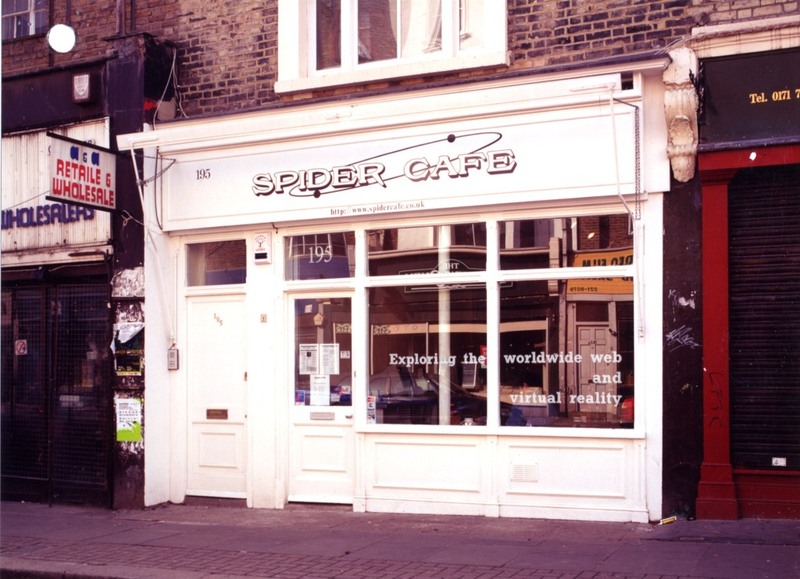 North Kensington has not yet become a particularly bohemian or counter cultural area. These images are from the other side of a cultural divide. It’s a view of almost forgotten working class west London. 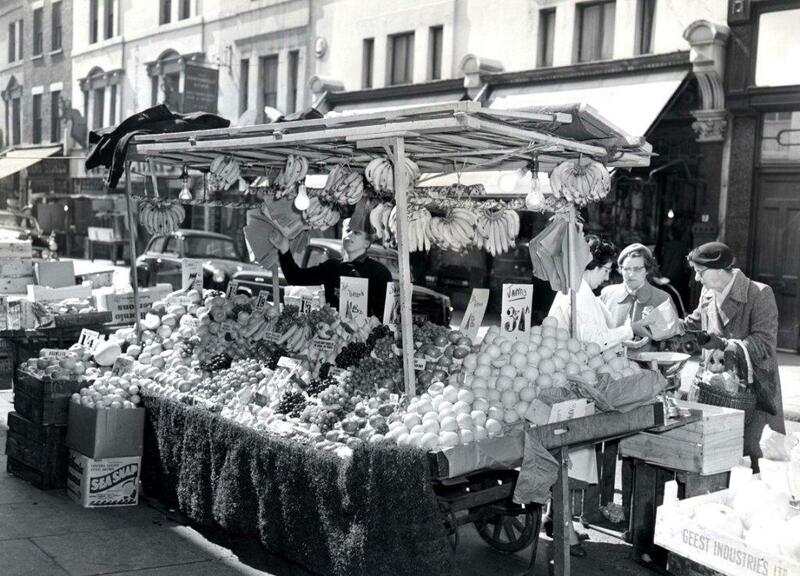 That’s Mr Brooks and his vegetable stall. 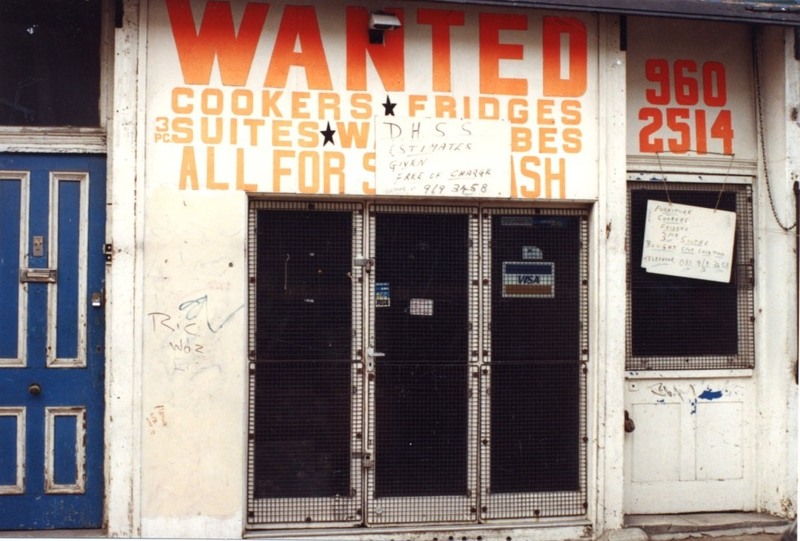 A hard working photographer from the Ministry of Health took these photographs to illustrate a now forgotten display about food retailing. 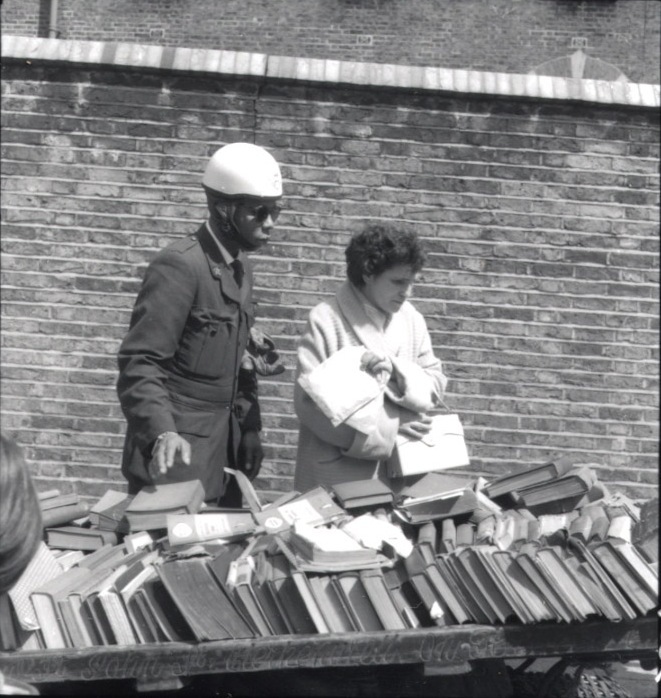 They would have been thrown away if the man who donated them to the Local Studies collection had not had been thinking of their value to later generations. 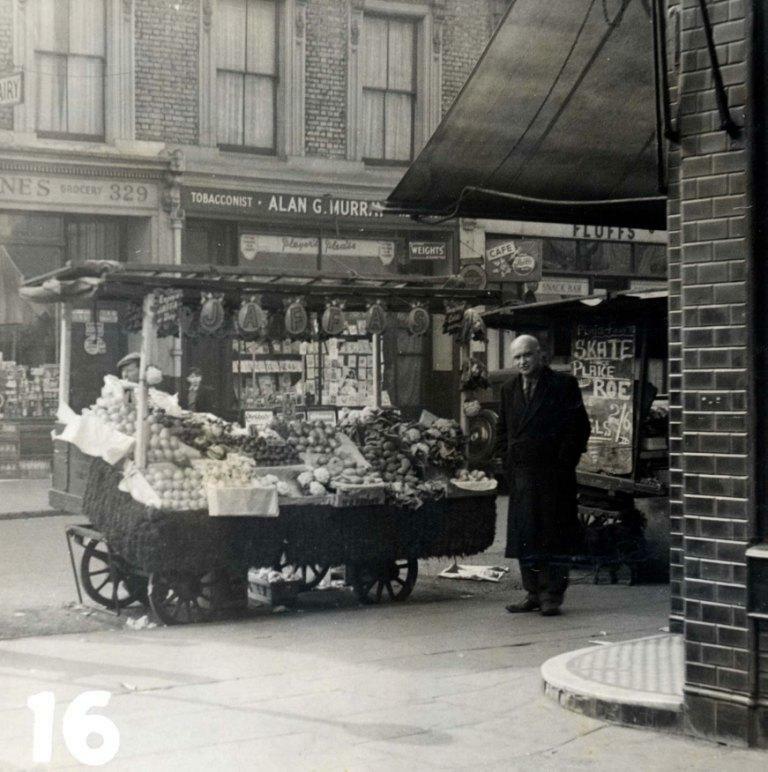 A little further down from Mr Brooks’ stall is a branch of the once ubiquitous Woolworth’s stores. 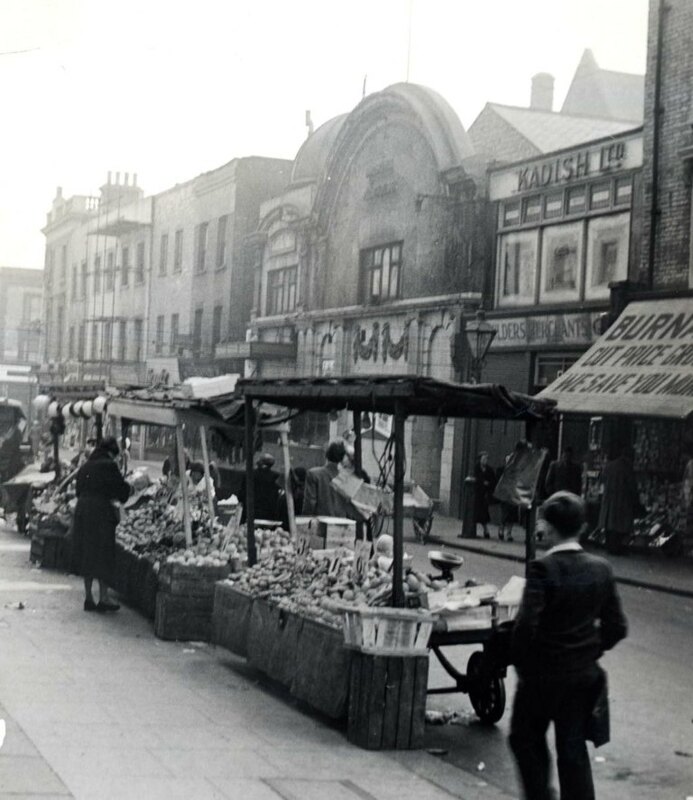 In this photo you can see the Electric Cinema looking a little grim but obviously open, one of the longest surviving institutions of Portobello Road. 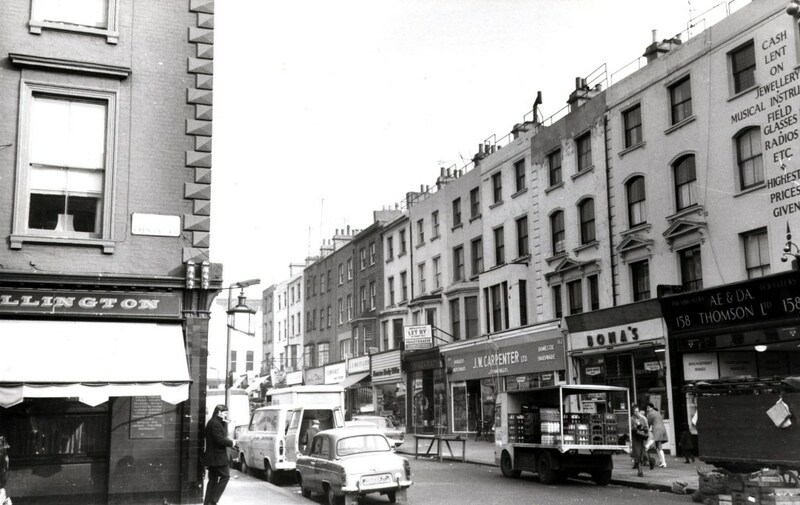 In 1958, according to that year’s Kelly’s it was trading as the Imperial Playhouse. 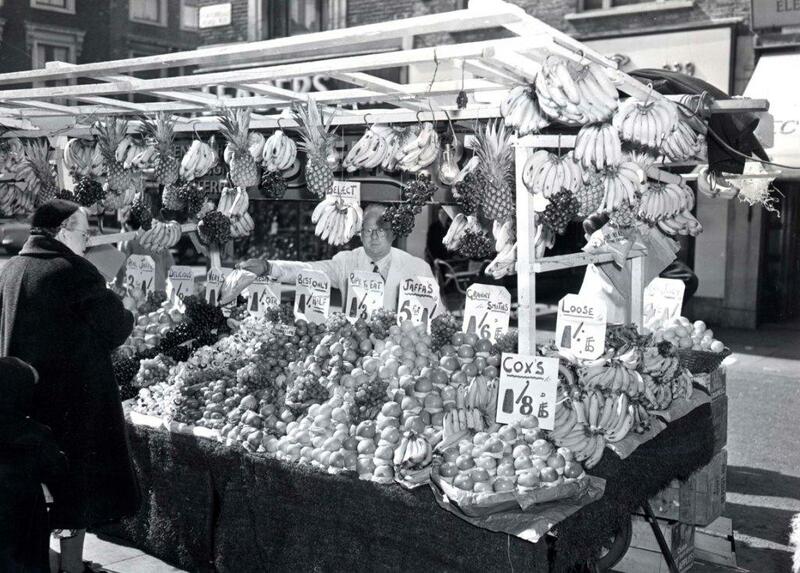 But fruit and vegetable stalls in gloomy streets are not the whole Portobello story even in the late 50s. 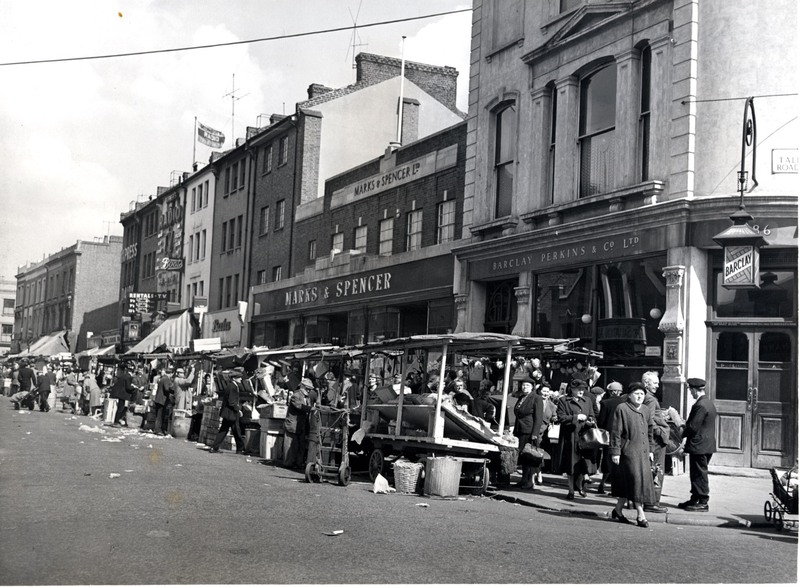 The market even then was an outlet for antiques, bric a brac and other second hand goods as shown in another set of photographs from the same period. I think you can see a couple of penguin paperbacks on top of the pile of books. I couldn’t resist including this one. Some kind of basket made out of a dead armadillo. Try getting one of those on e-Bay. This set of photographs seem brighter and more optimistic to my 21st century eye. Perhaps it’s just that they were taken on a sunny day or perhaps it’s the fact that the people in the pictures are not buying food but browsing for more interesting items. 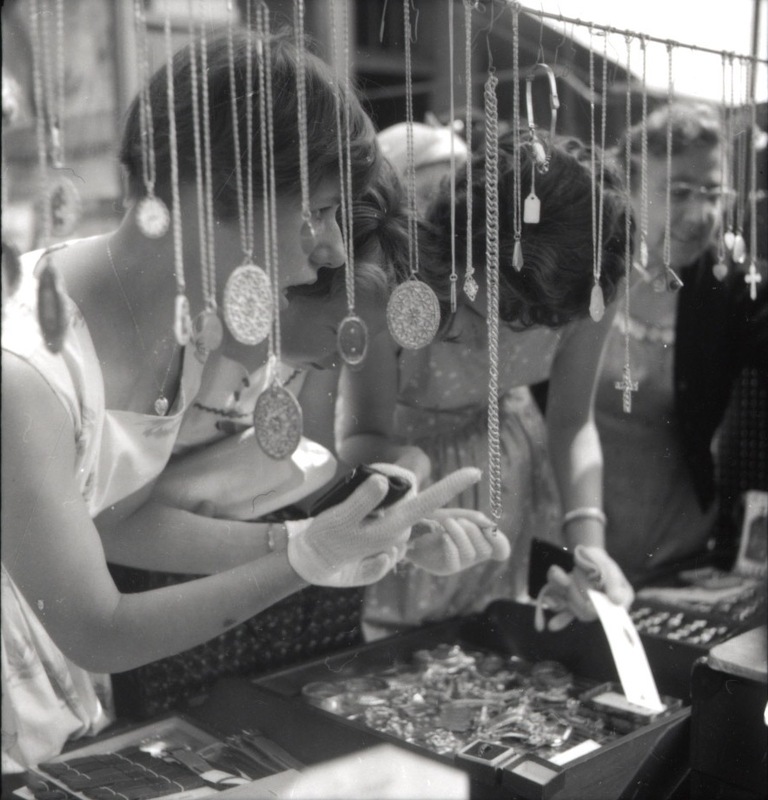 A trio of excited young women examine the contents of a stall selling jewellery. The detail that caught my eye was that all three are wearing gloves. So we’re still on the other side of that cultural divide. 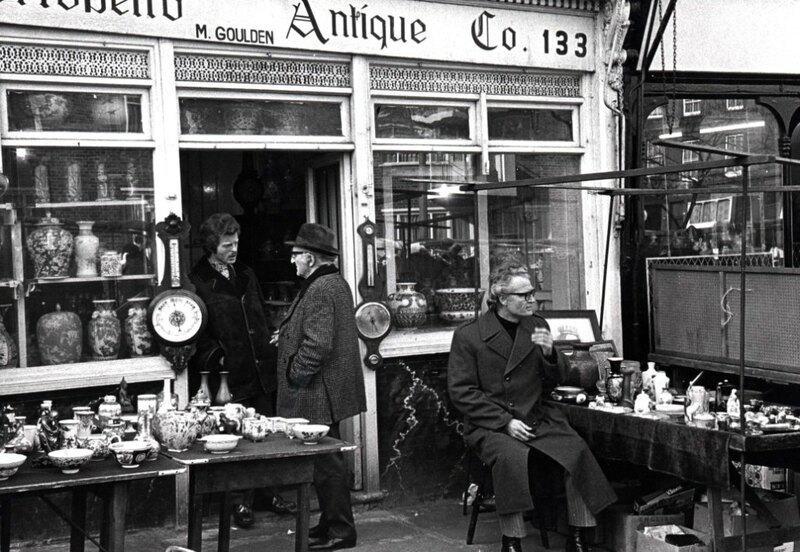 The next time we go to the Portobello Road it will be to the 1970s a far more familiar era. 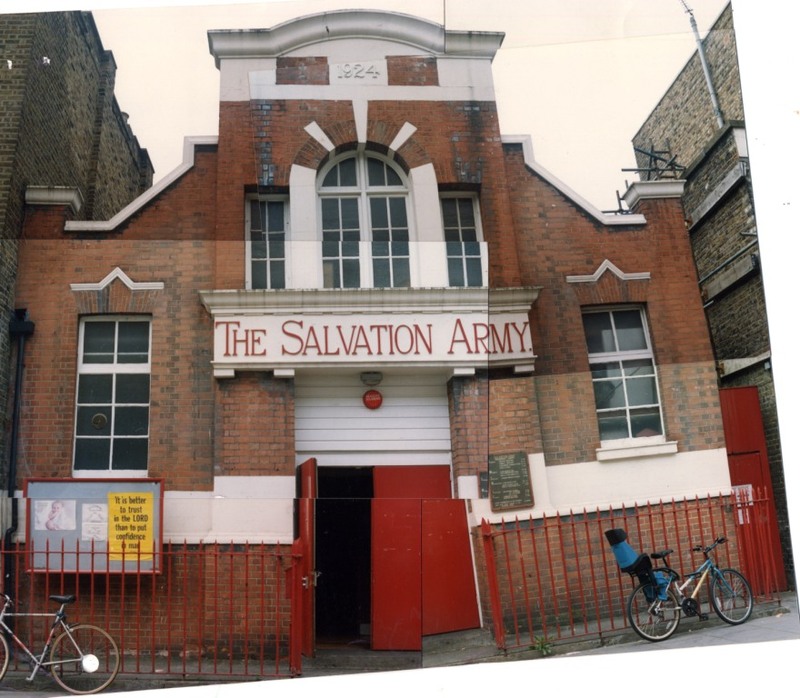 Thanks to the unknown Ministry photographer and to Corry Bevington who took the other photographs which are from the HistoryTalk collection.